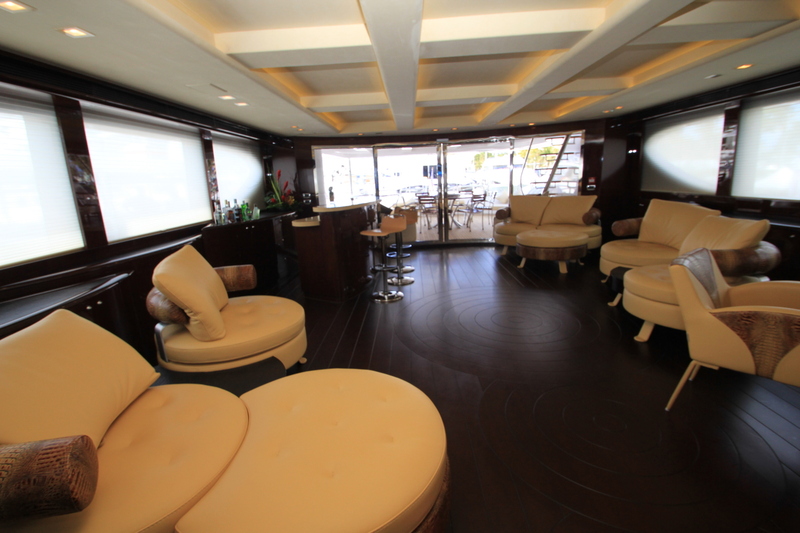 The majesty of DREAMER is apparent the moment you enter the main salon. 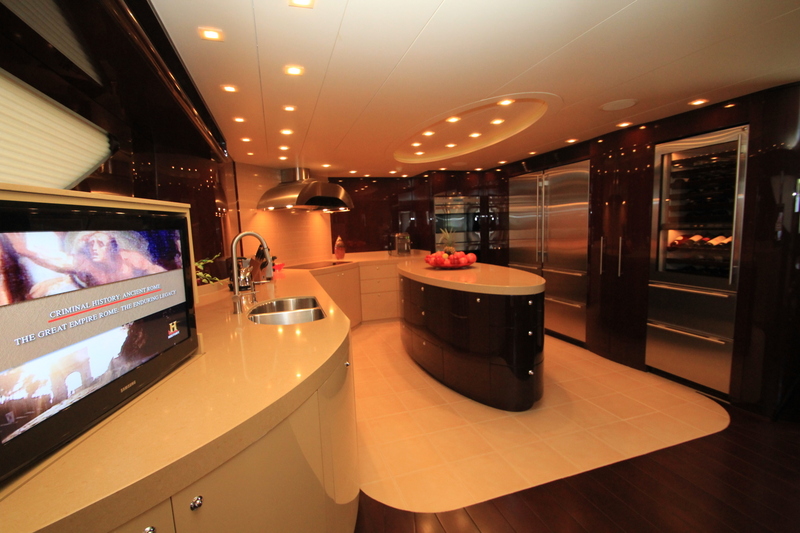 The owner personally hand-picked everything you see. 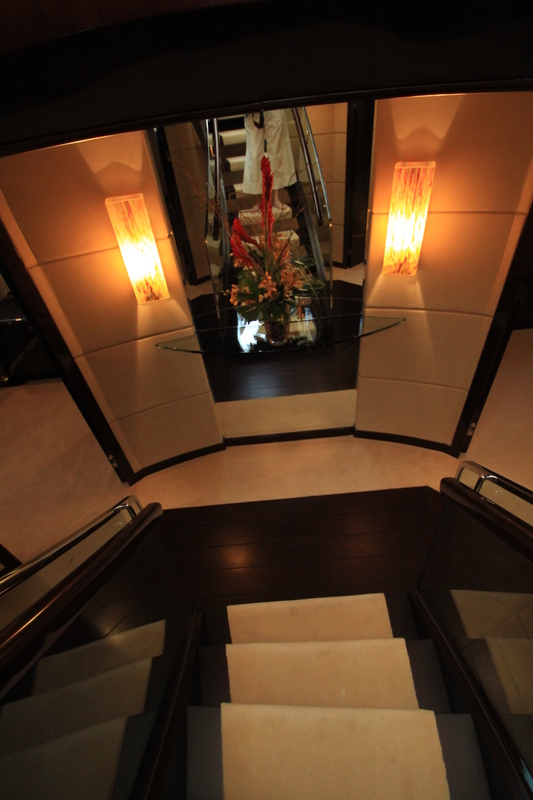 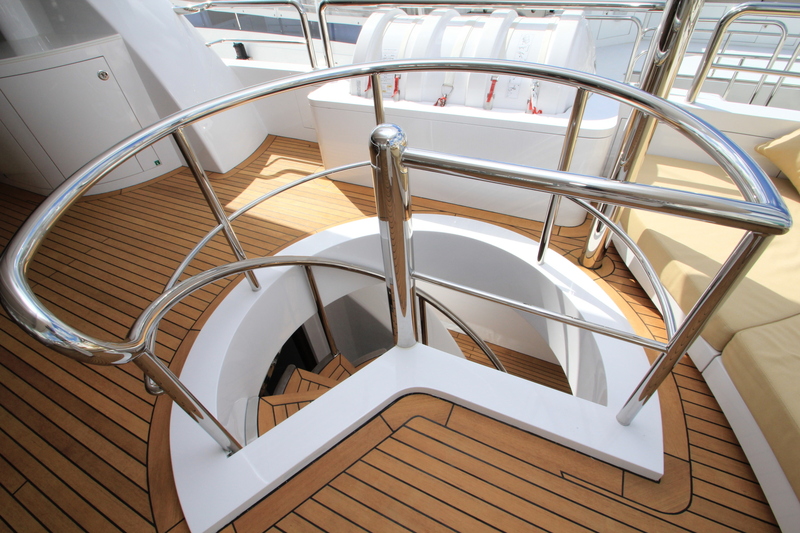 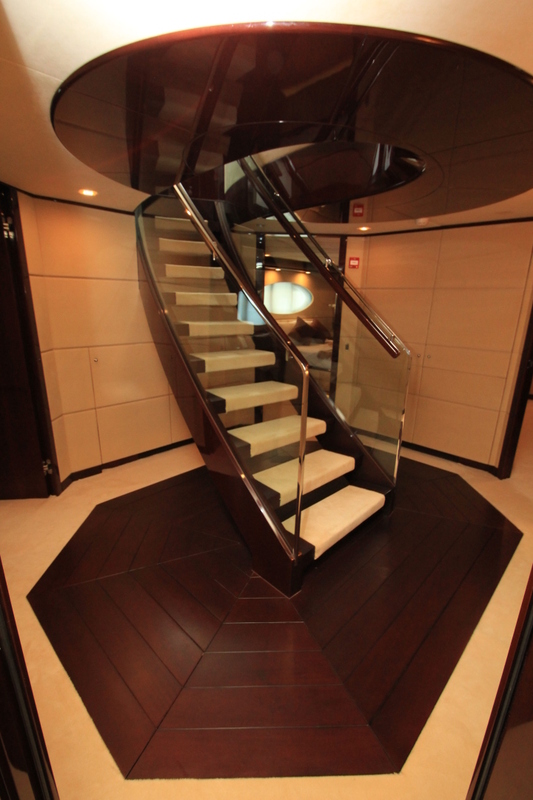 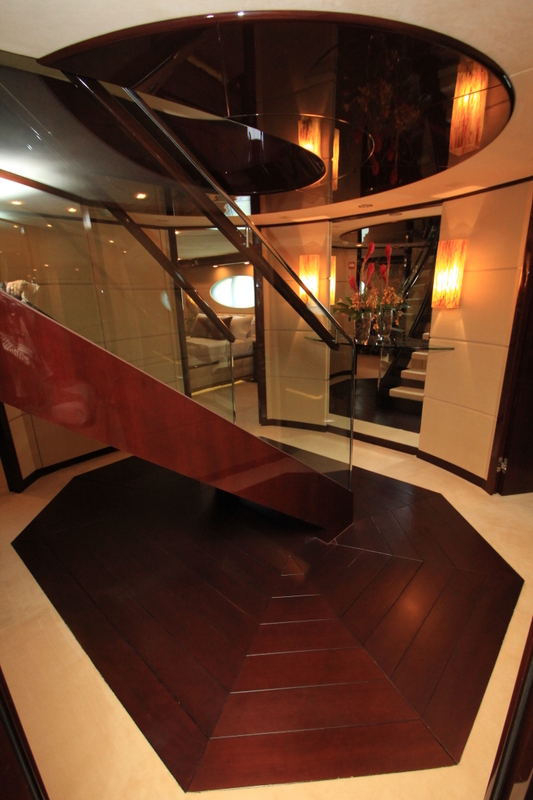 The curved bar to starboard welcomes you, as does rich-toned mahogany beneath your feet. 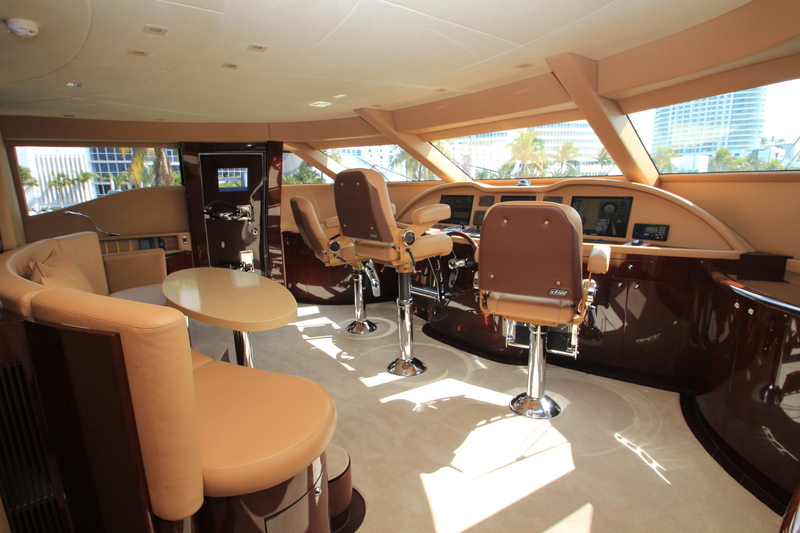 Four Italian Formenti leather seats encourage you to sit and linger a while, taking in the voluminous feel thanks to 7’3” headroom and the 27' beam. 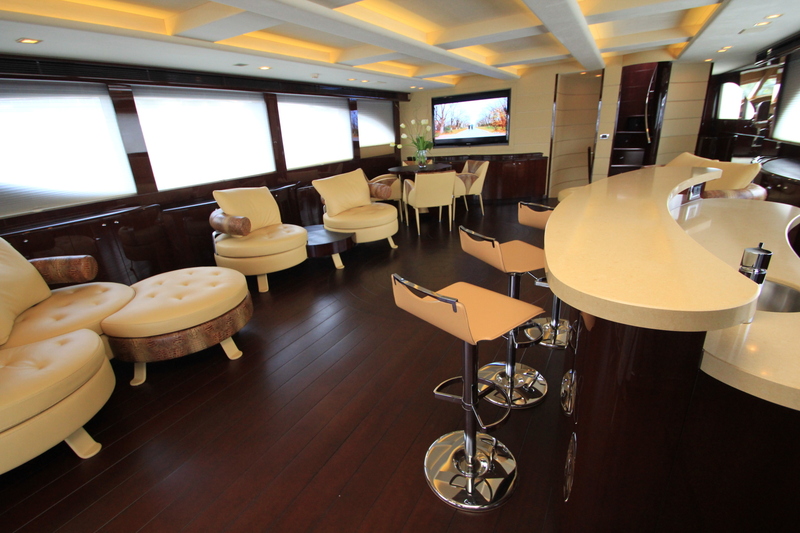 Leave your drink on the bar’s CaesarStone quartz countertop to explore the rest of the saloon, with its custom carpeting, high-gloss, amber-stained walls, mahogany cabinetry, and soft leather Formenti furnishings. 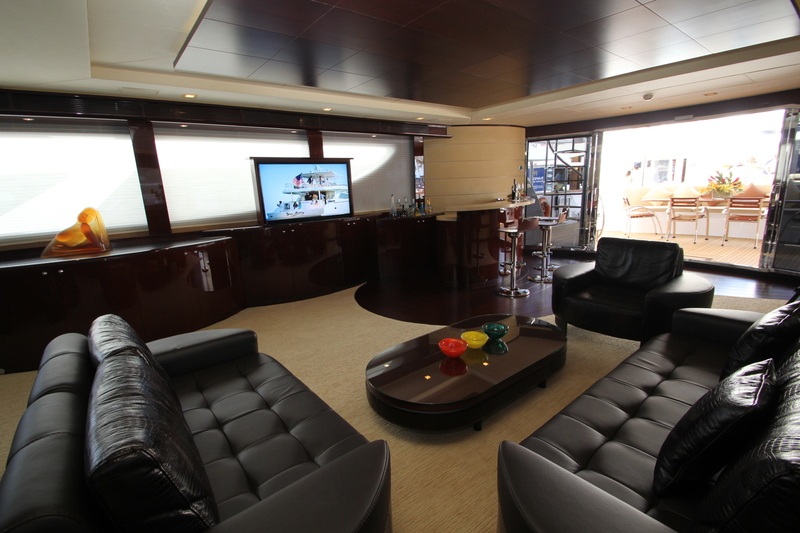 Watch a movie on the 52-inch television that rises from the cabinetry, enjoying a theater-like atmosphere thanks to Surround Sound. 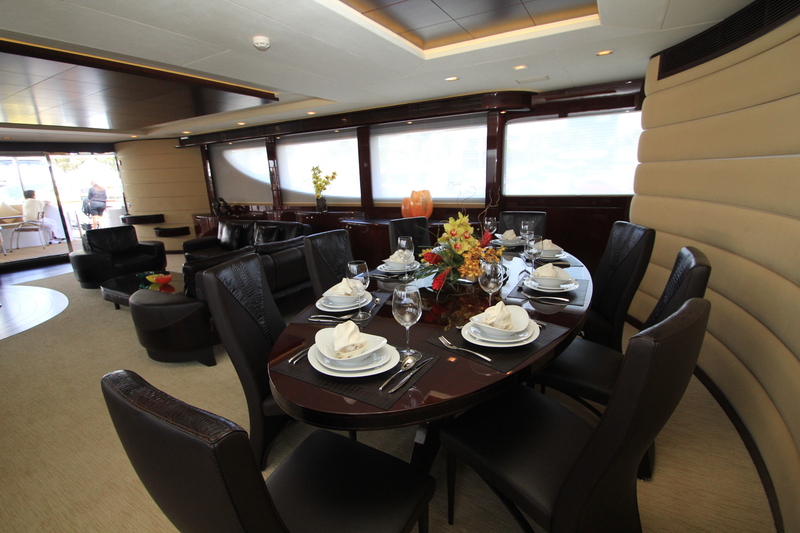 For formal meals, the dining area directly forward caters to eight people. 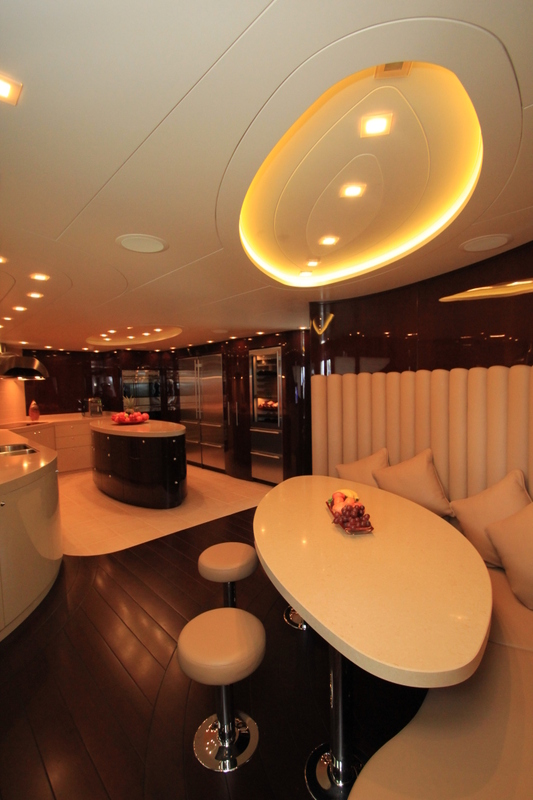 The curves of the custom-made table echo those of the wheat-toned, sueded wall just ahead, while a gold square ceiling medallion dazzles overhead. 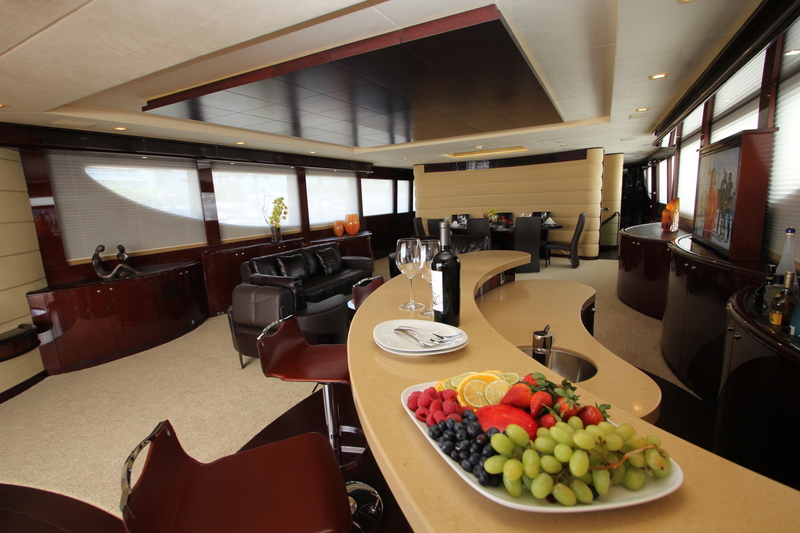 Should you wish some wine to accompany your meal, make your selection from the 78-bottle Sub-Zero chiller/storage unit in the professionally equipped galley. 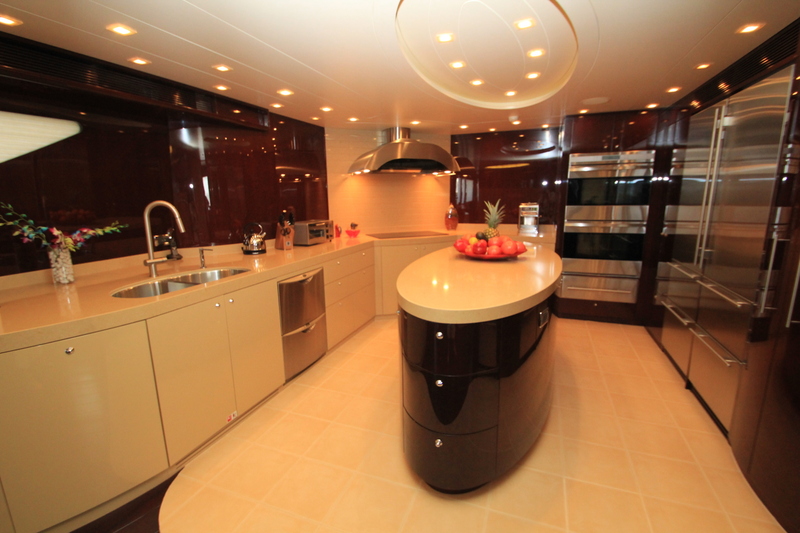 The chef has all the top-level appliances at hand, plus excellent CaesarStone quartz counter space and a prep island with mahogany cabinetry and CaesarStone top. 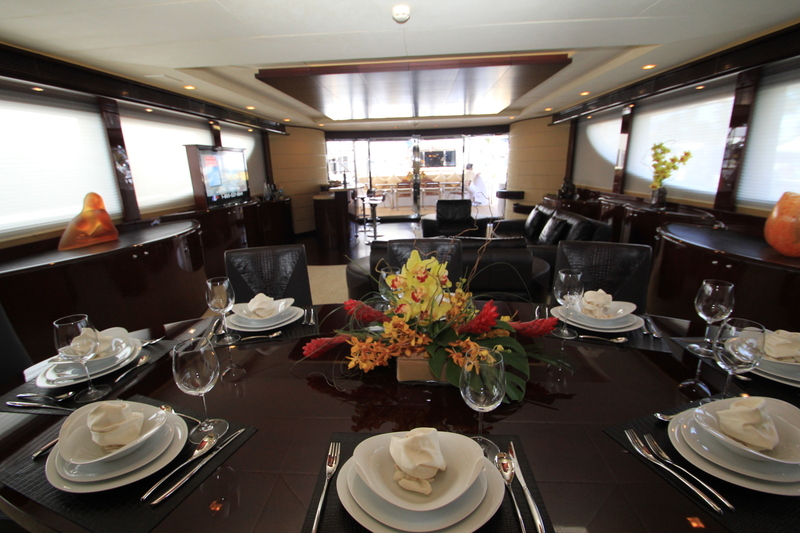 Of course, DREAMER invites you to enjoy meals outside, too. 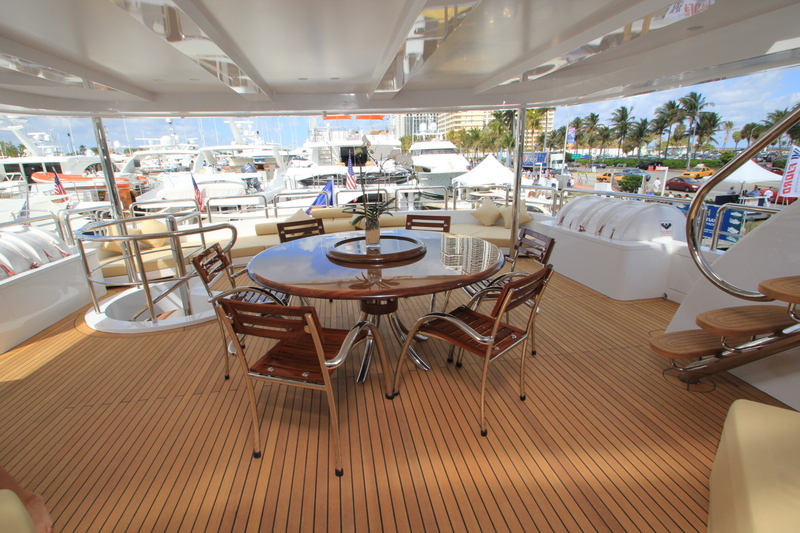 The aft sky deck is ideal, with Corian countertops large enough to stage platters and a teak Lazy Susan in the table. 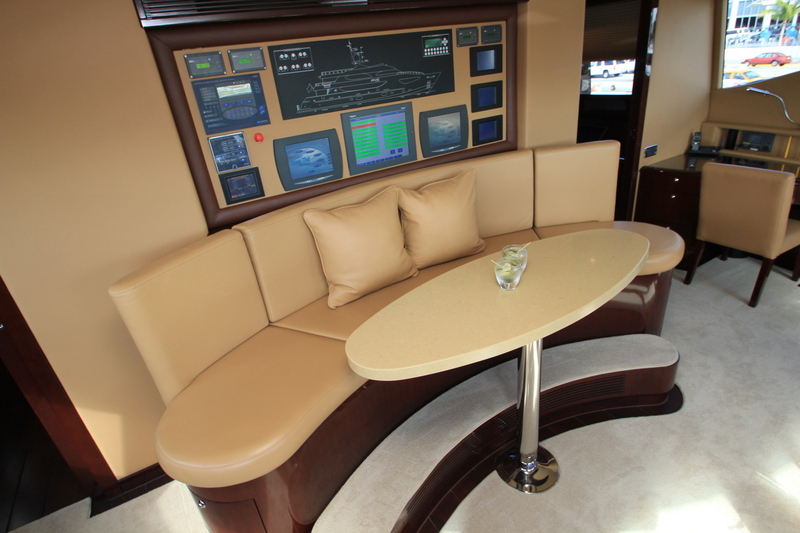 Head up to the fly bridge for more sun and relaxation, thanks to two settees with tables for 12, a custom six-person hot tub and sunpad, plus a bar and barbecue. 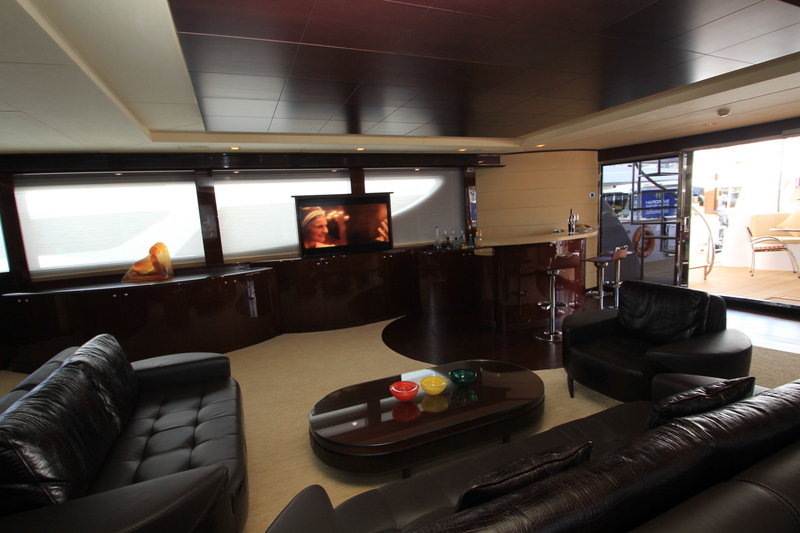 Consider having after-dinner drinks in the spacious sky lounge. 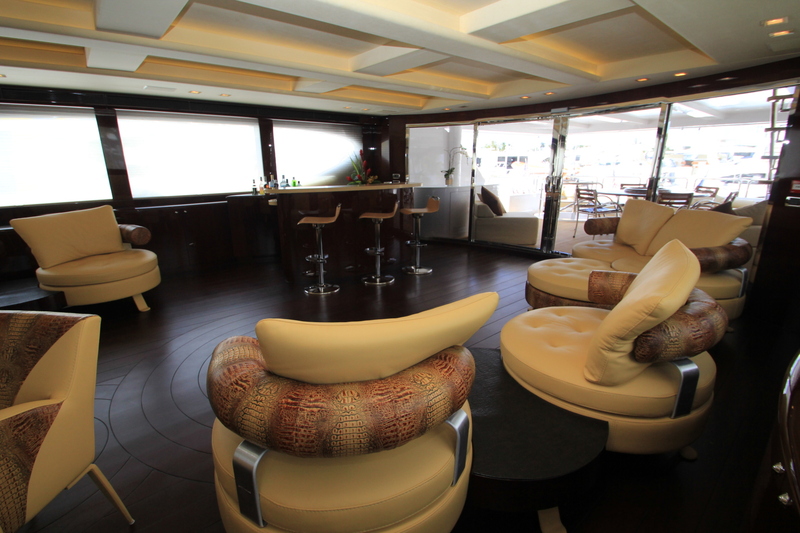 The bar stools and club chairs are all made of the softest Italian leather, while four upholstered dining chairs are arranged around a mahogany table. 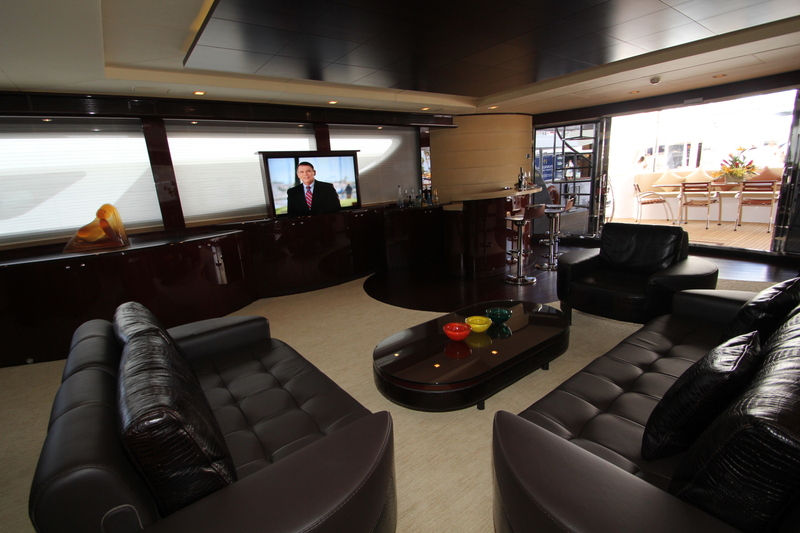 They all invite you to settle in and watch a movie on the 65-inch plasma TV. 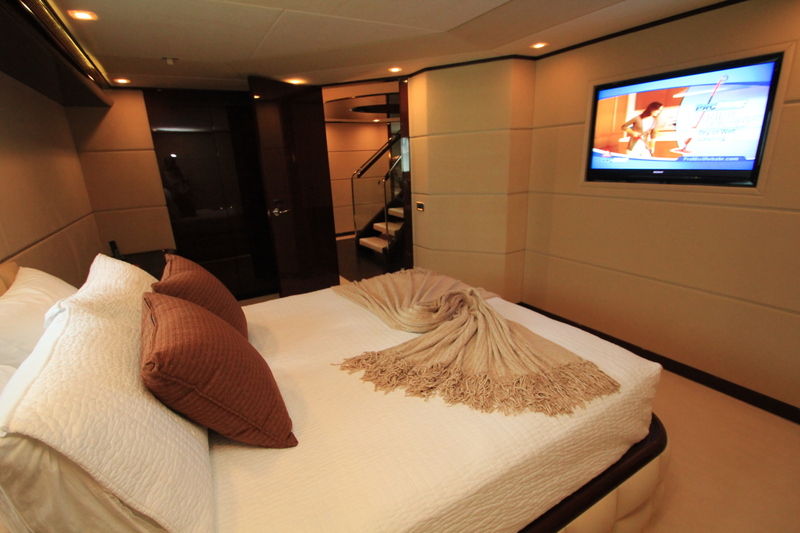 Come evening, the master suite and four guest staterooms provide abundant accommodations for 13. 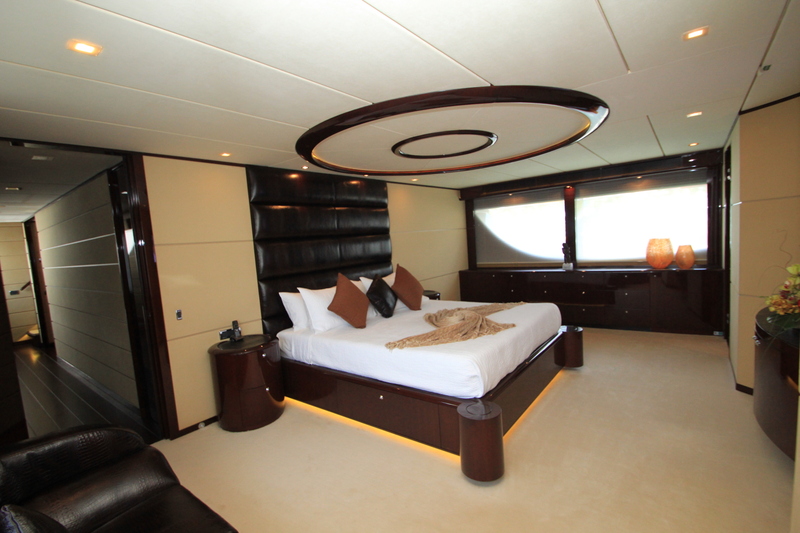 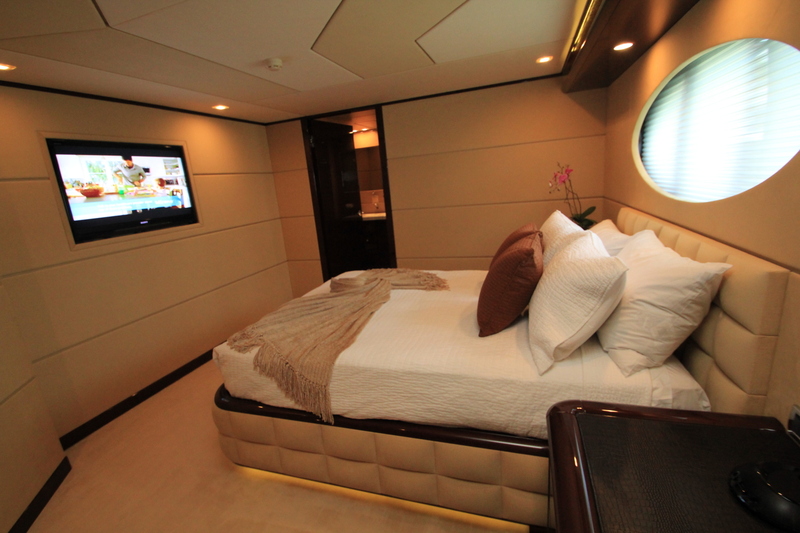 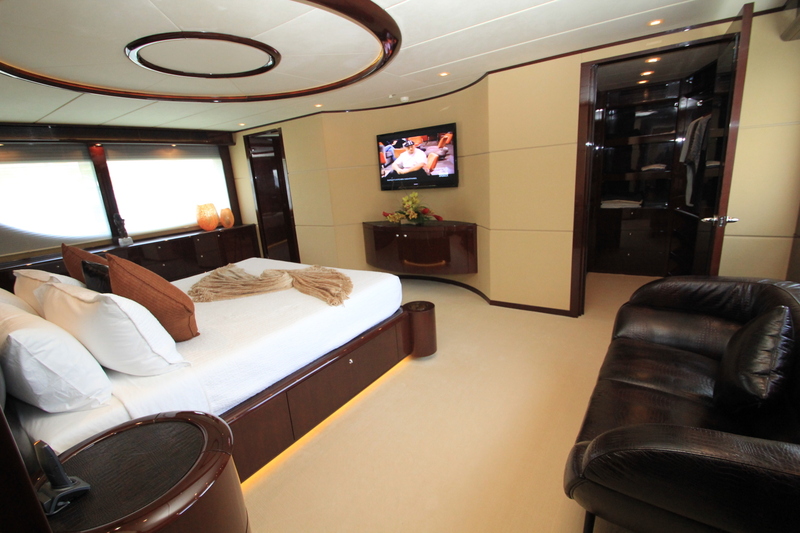 Fully forward on the main deck, DREAMER’s master features a king-size berth with a crocodile leather upholstered headboard. 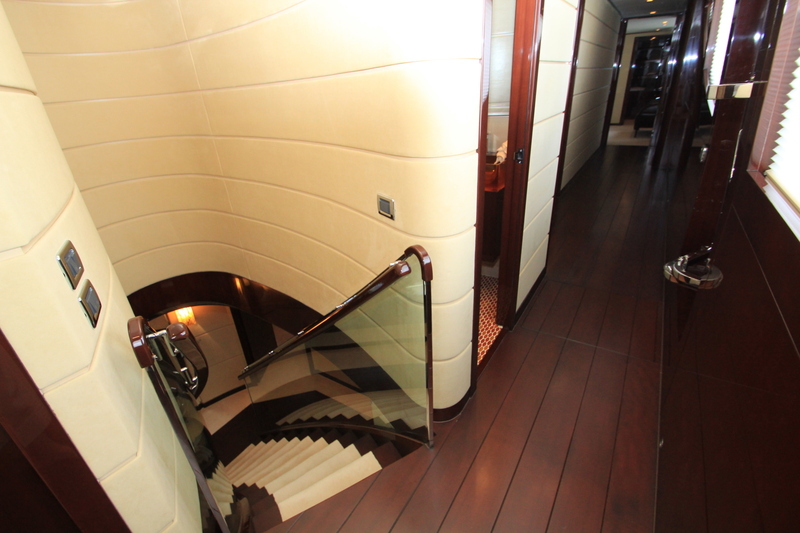 Wheat-toned sueded walls, with ivory strips, complete the look. 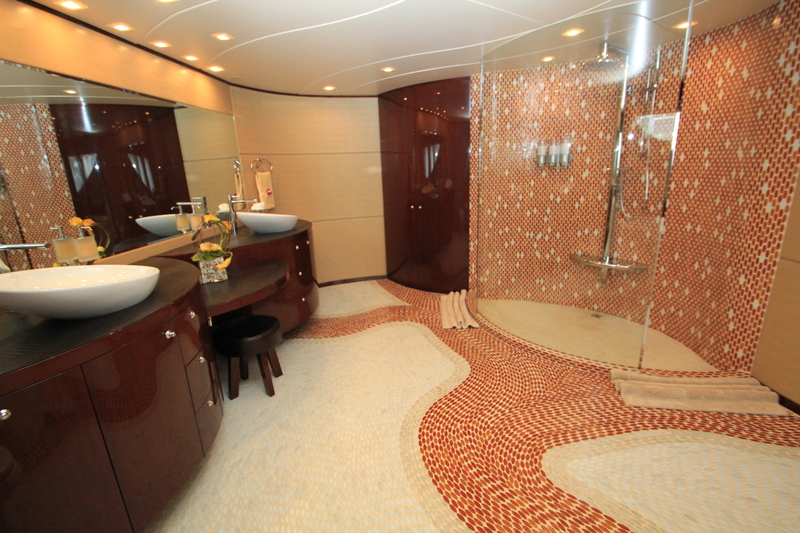 The master bath is a study in intricate design, with a dazzling, free-form mosaic Italian tile floor, raised-bowl sinks, and a custom rounded spa bath, in addition to a frameless, curved-glass shower. 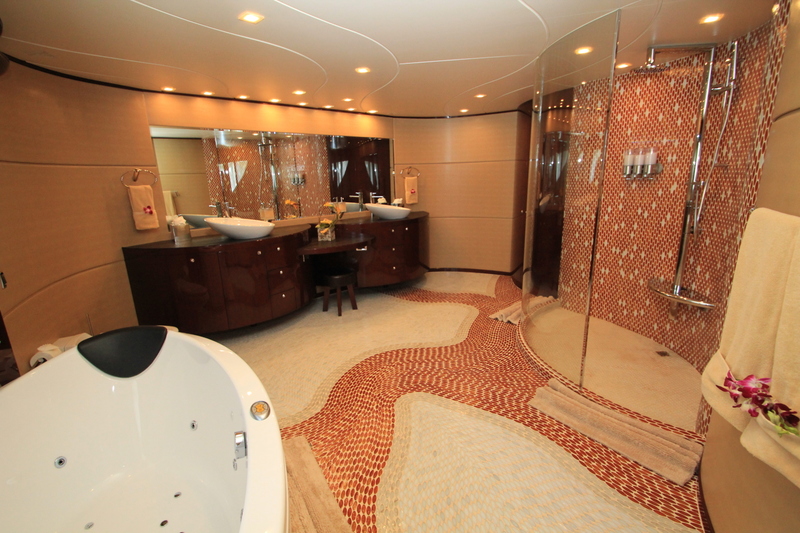 No detail was left out by the owner or Hargrave. 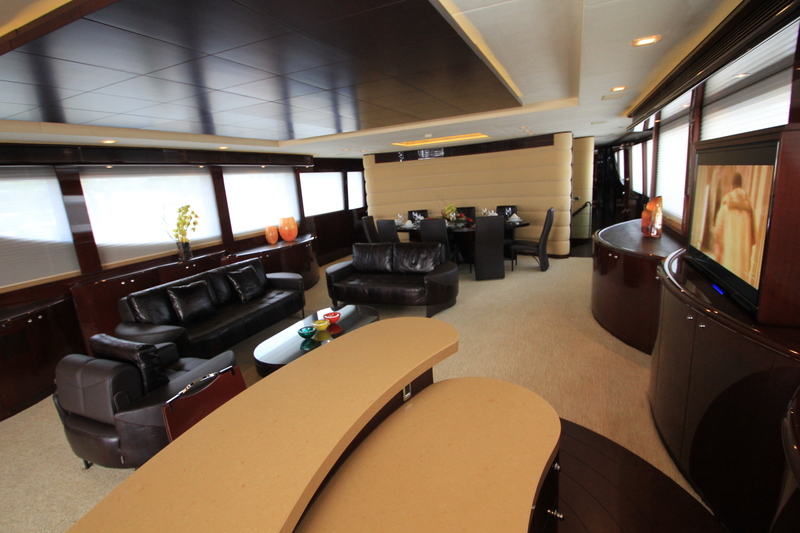 Treat your guests to three VIP staterooms below decks, each with a queen berth. 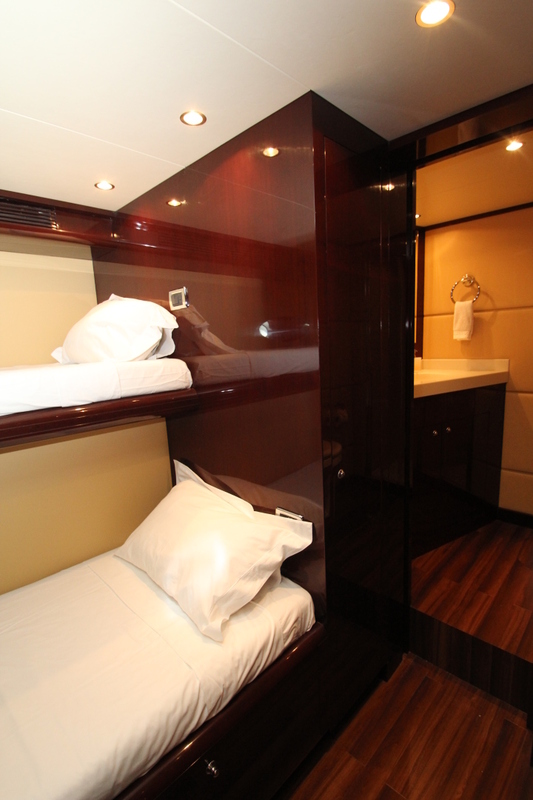 A fourth stateroom, featuring twin berths and a Pullman, is ideal for single adults or children. 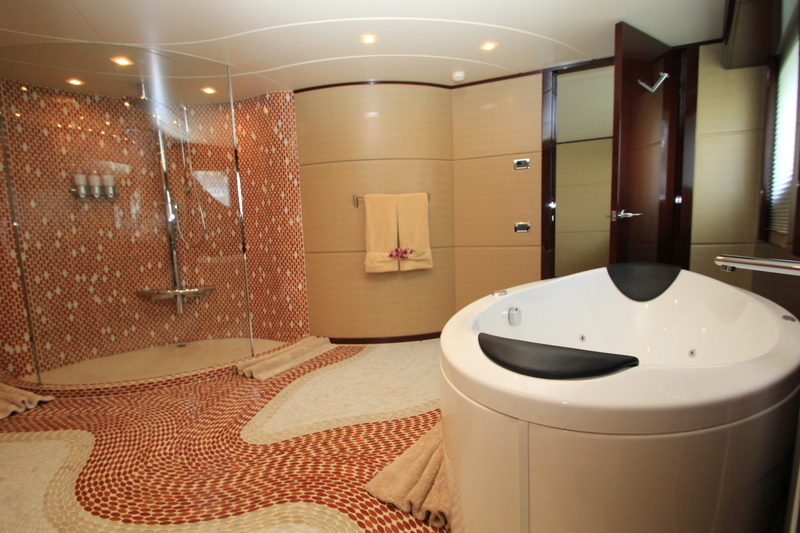 All have en suite facilities with mahogany cabinetry and beautiful hand-laid tile floors. 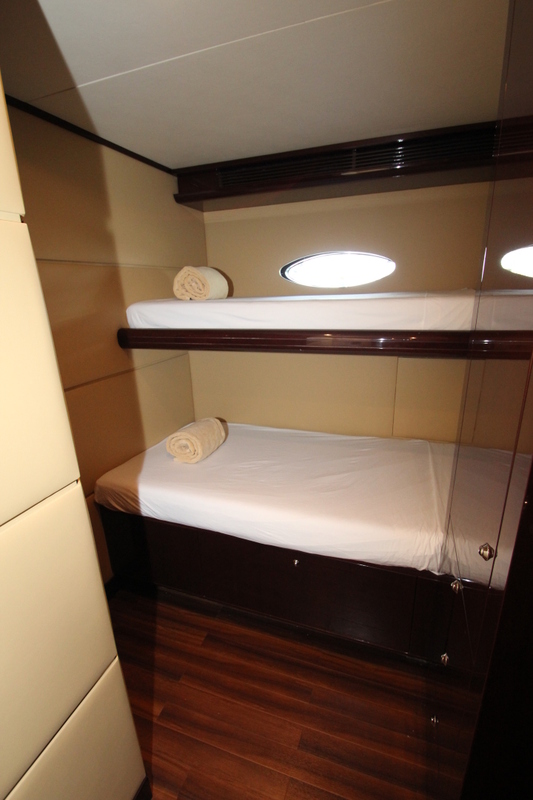 Should additional children be aboard, the starboard VIP stateroom yields access to a separate kid’s cabin, its bunk berths fitted with removable guardrails. 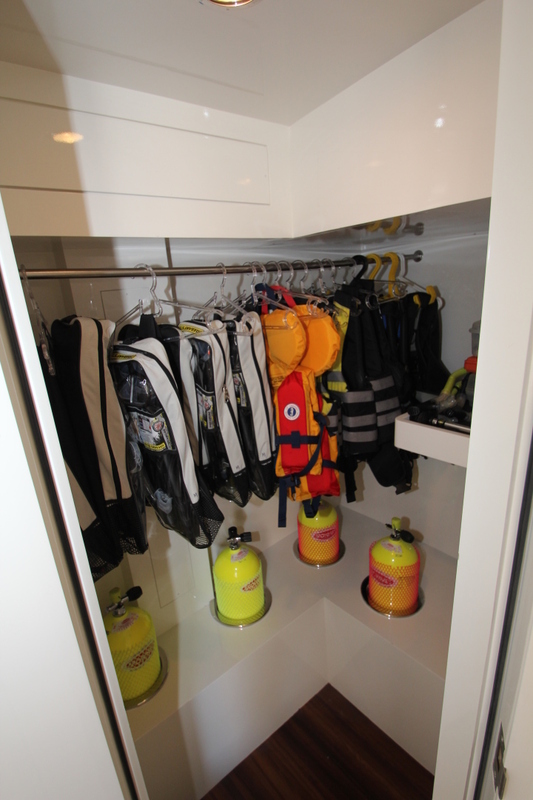 Just as no detail has been overlooked in DREAMER’s decor, so, too, has nothing been left to chance in outfitting her technical areas. 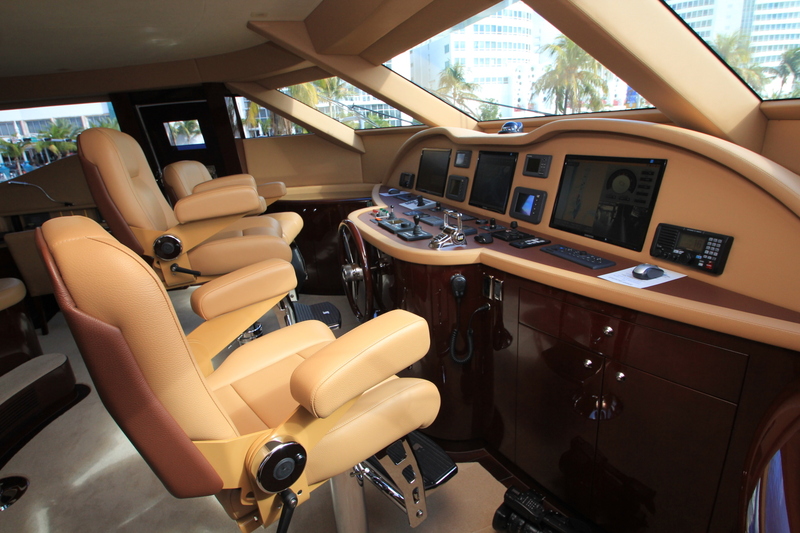 The pilothouse has state-of-the-art electronics for navigation and communications, and an exterior wing station to port on the Portuguese bridge aids the captain in docking and close-quarters maneuvering. 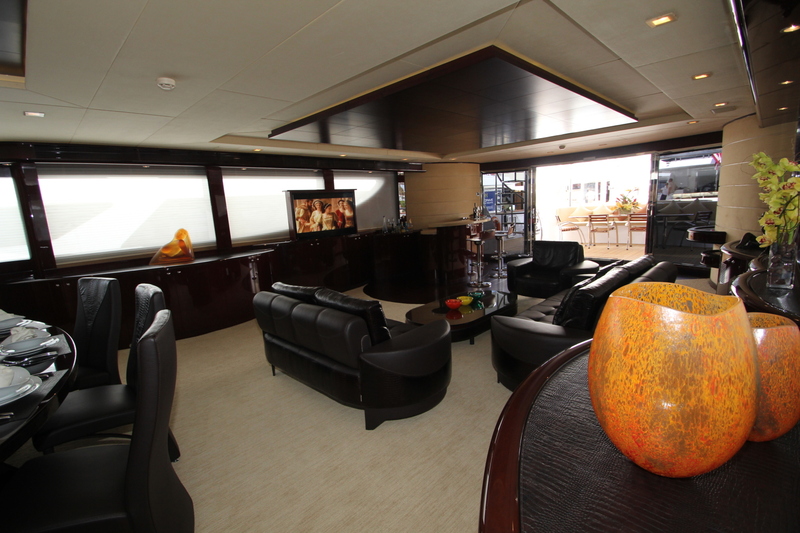 The captain’s cabin is directly aft of the pilothouse for convenience, while up to six additional crew have cabins below decks, finished to the same standards as the guest areas. 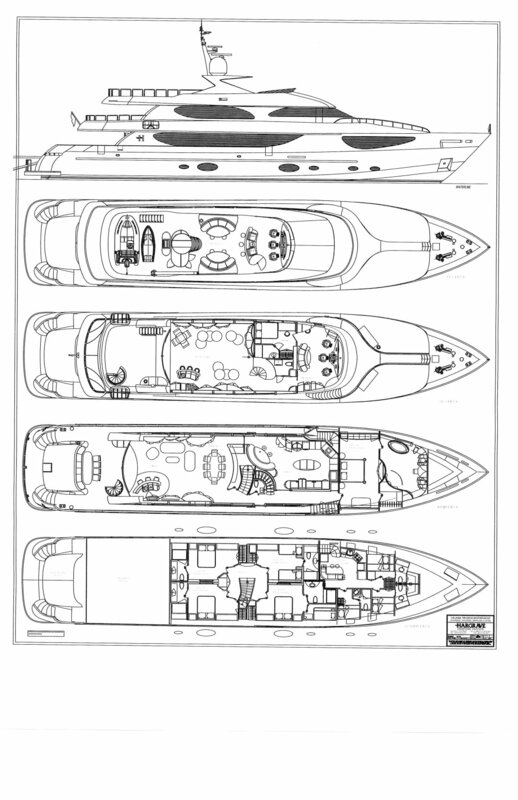 DREAMER embodies high-quality composite construction, built to full RINA Unrestricted classification. 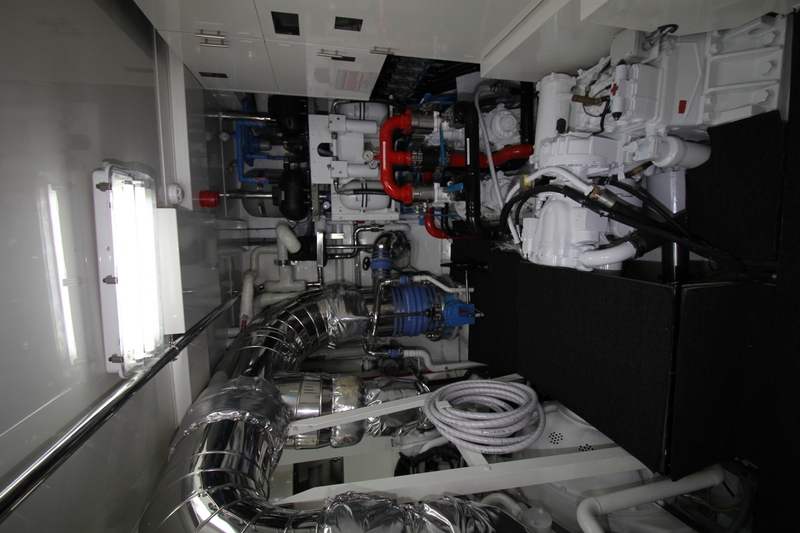 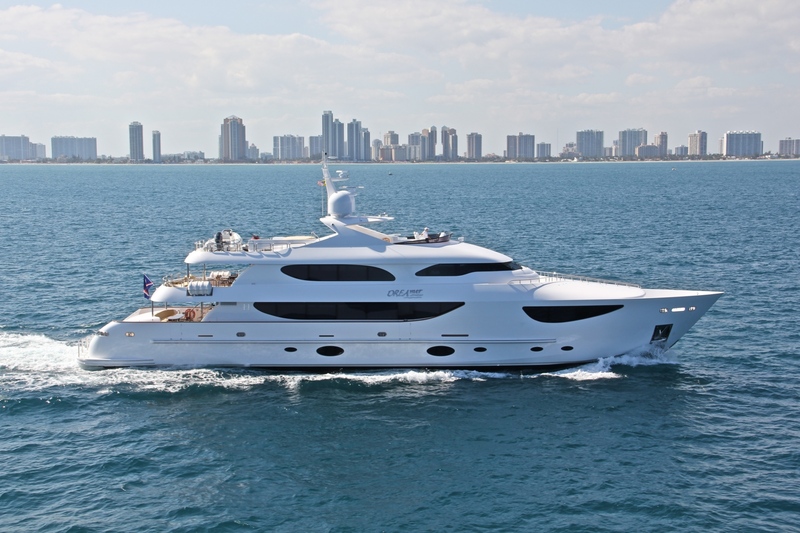 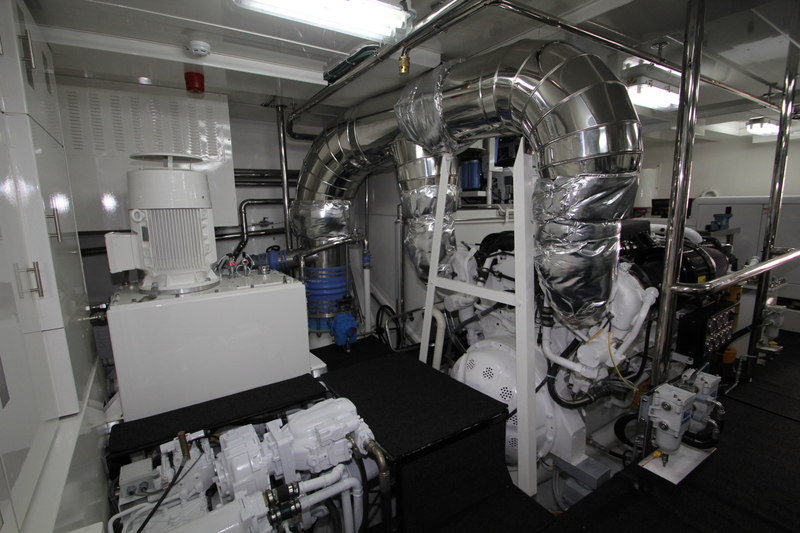 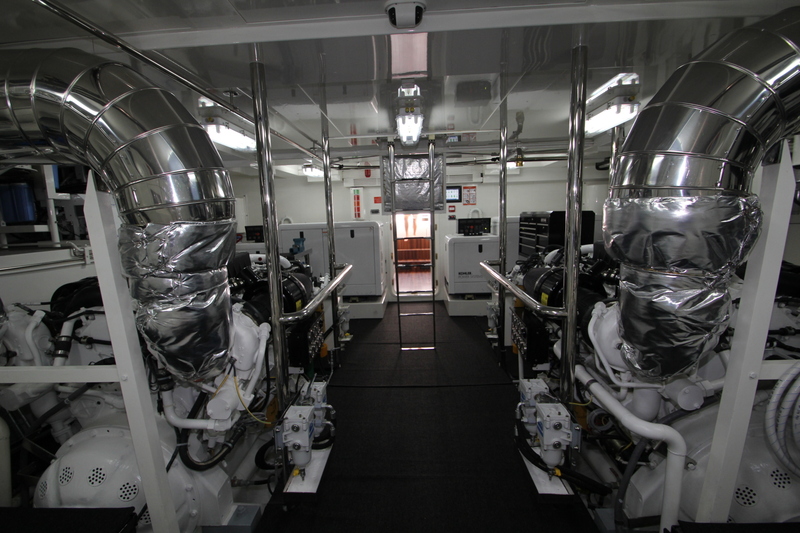 Twin 1,825-hp Caterpillar engines power her to a top speed of 18 knots and cruise speed of 16 knots, making her ideal for harbor hopping in the islands or exploring the posh ports of the Mediterranean. 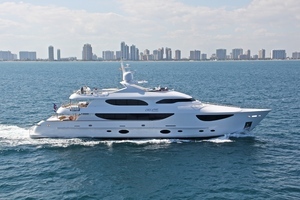 DREAMER is an exceptional example of one owner’s vision. 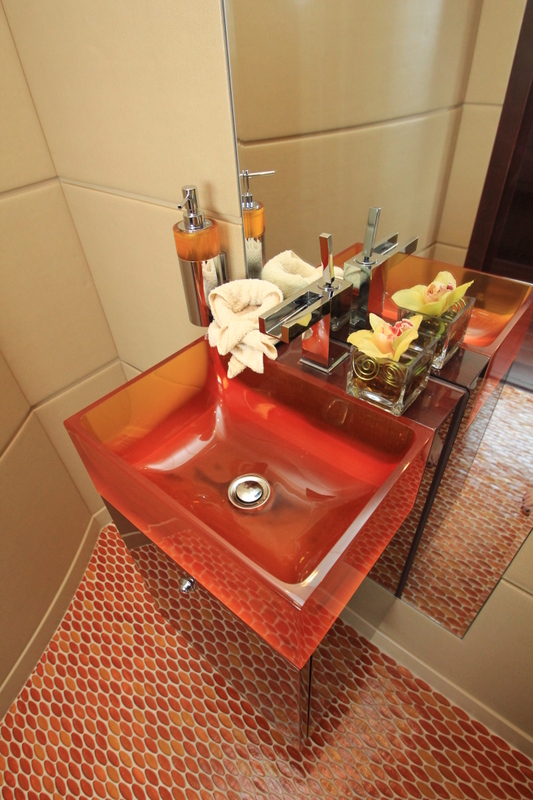 She’s also an exceptional example of how Hargrave ensures that high standards bring clients’ visions to life. 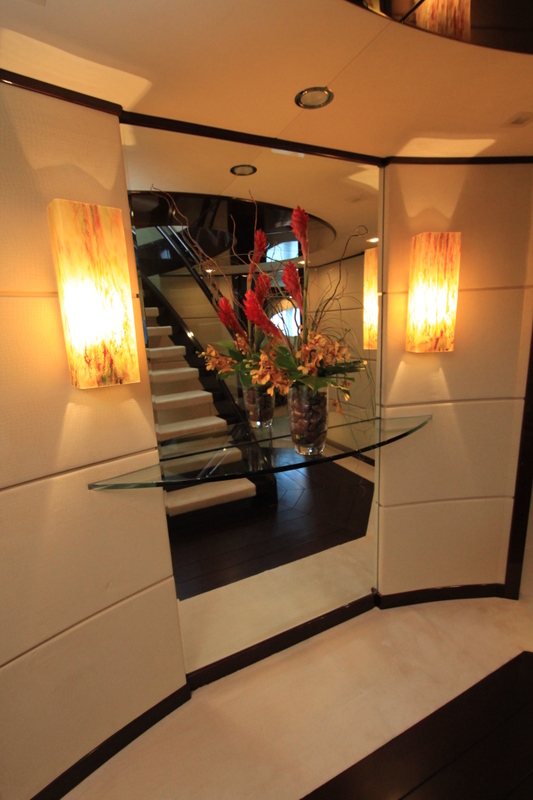 High gloss Matore amber stained walls. 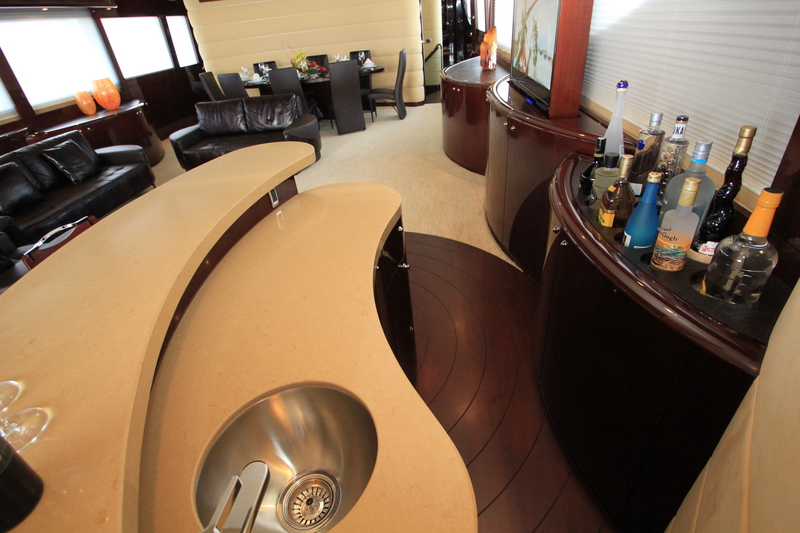 The bar top is Ceasar Stone. 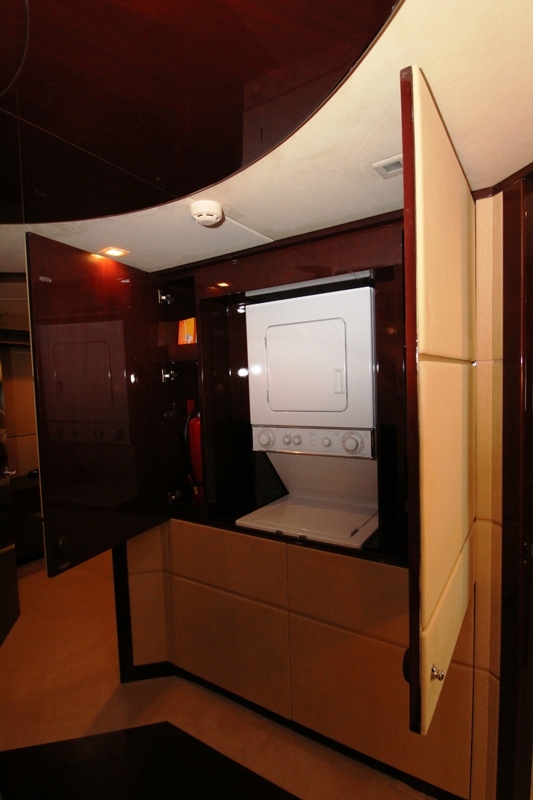 Denon Audio system with surround sound. 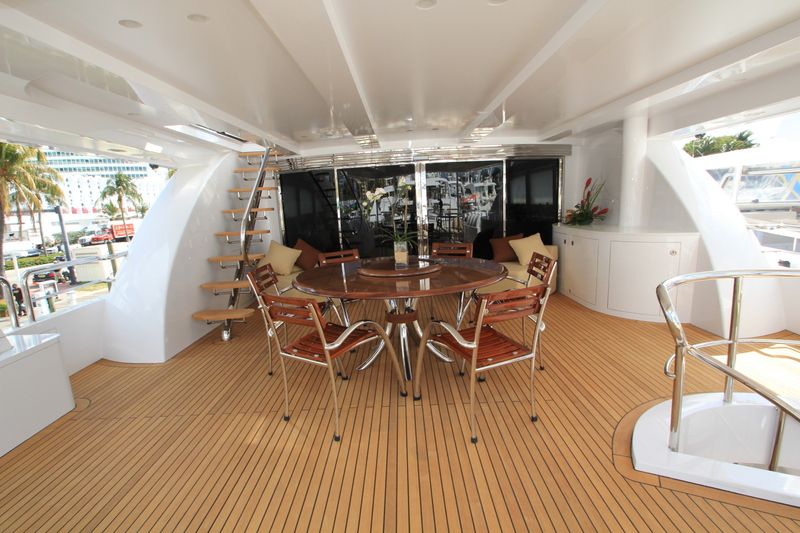 Dining table is custom made with the matorie stained and the shape of the table is the same shape as the back of the curved wall in ultra suede with the A/C above, allows an extra 10” of walk way in the salon/dining area. 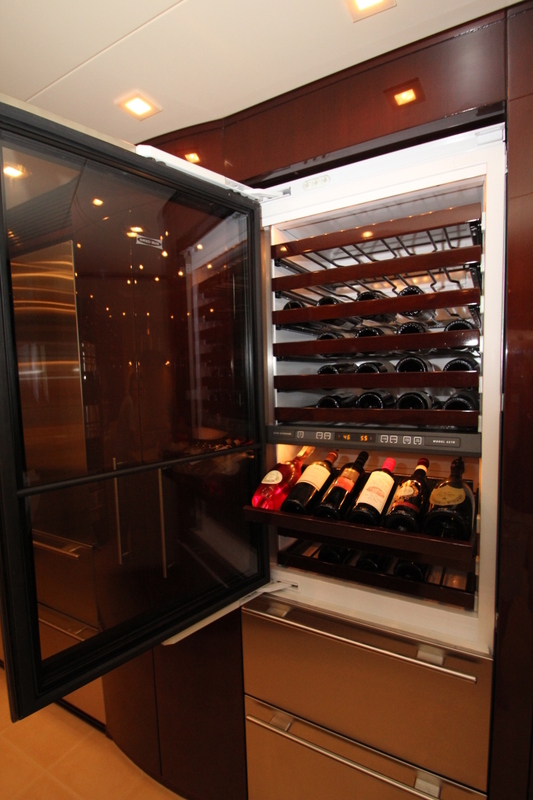 SubZero 427R Wine/Refrigerator unit offers eight shelves of wine storage above with two refrigerated drawers underneath. 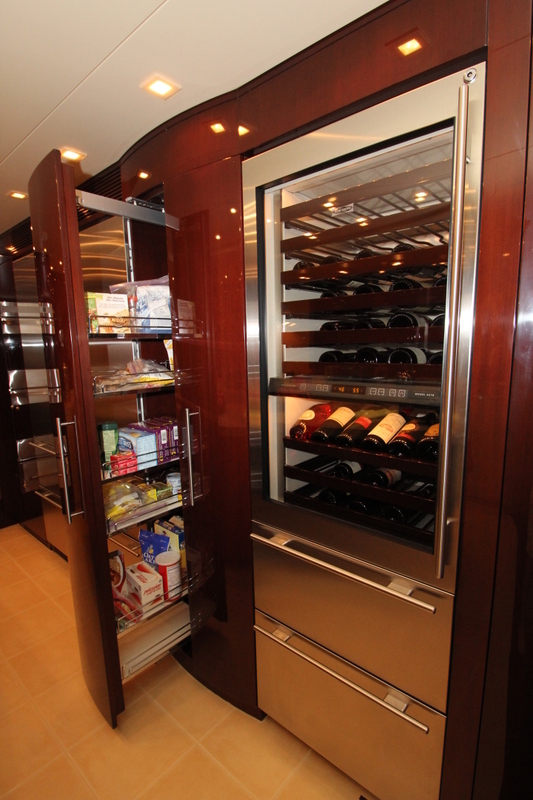 The two individually controlled wine storage zones hold up to 78 bottles. 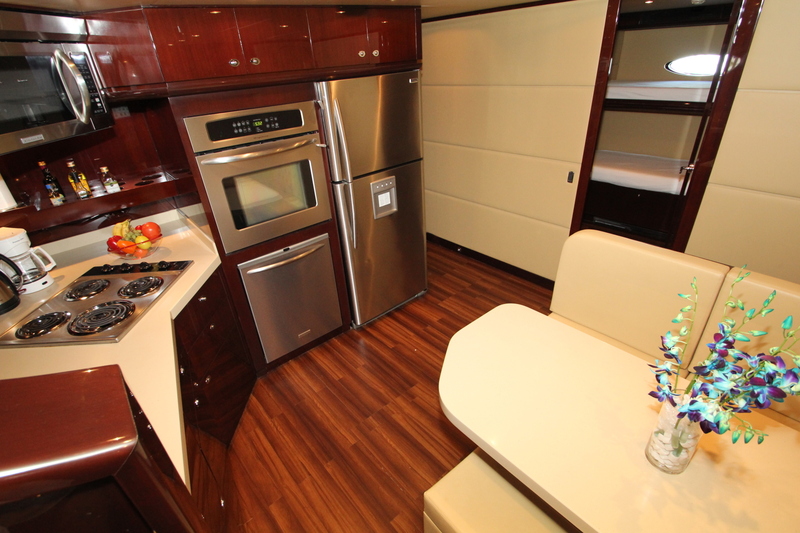 The lacquer on the perimeter cabinetry matches the color of the Caesar Stone countertops. 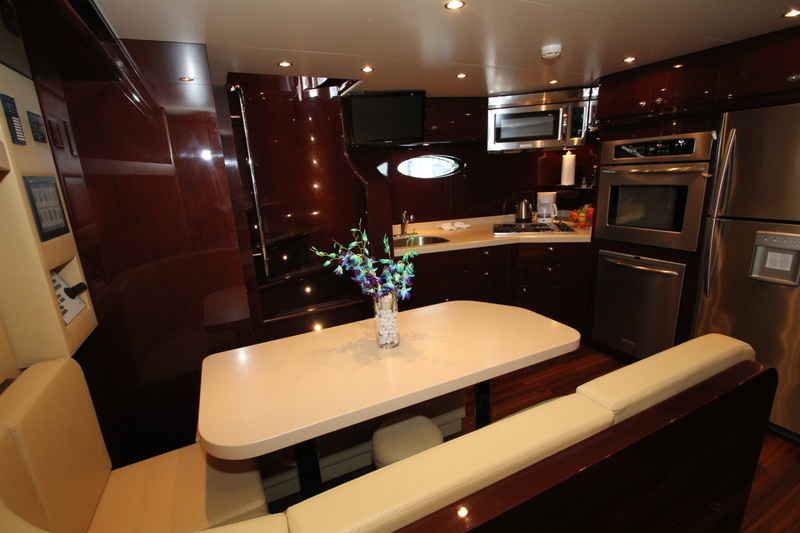 The island is mahogany cabinetry with tons of storage and Caesar Stone countertop. 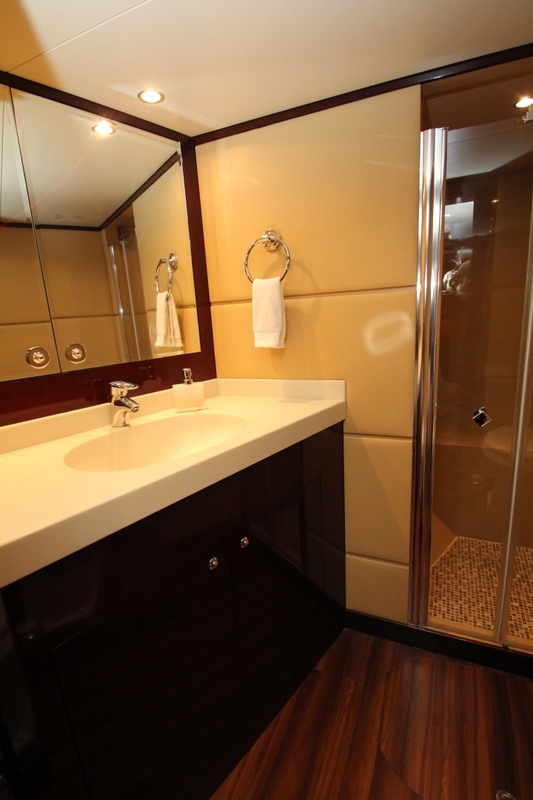 The Captain's Stateroom is located on the bridge deck aft of the helm area with a queen berth, en suite head and separate desk for their use. 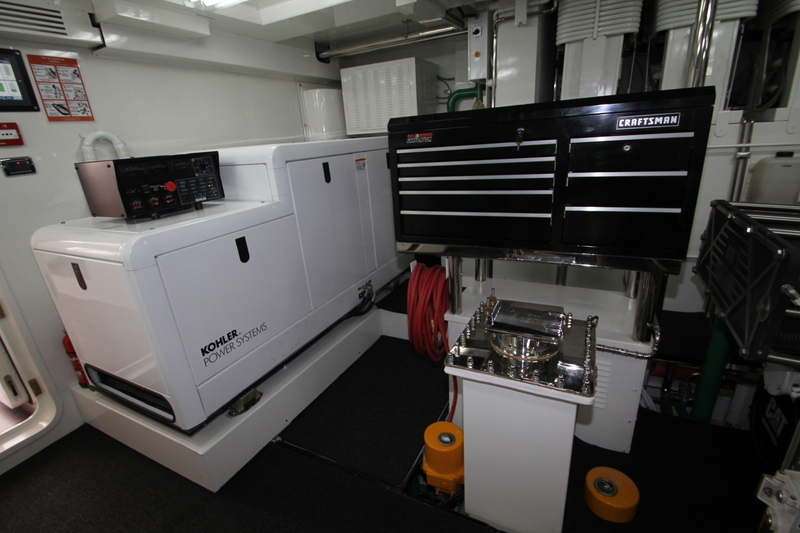 Helm Station equipped with Furino Navnet 3D, Nobeltec, SEE SEA Cameras and controller, FlIVR Navigator and ACR Search light, IComm VHF. 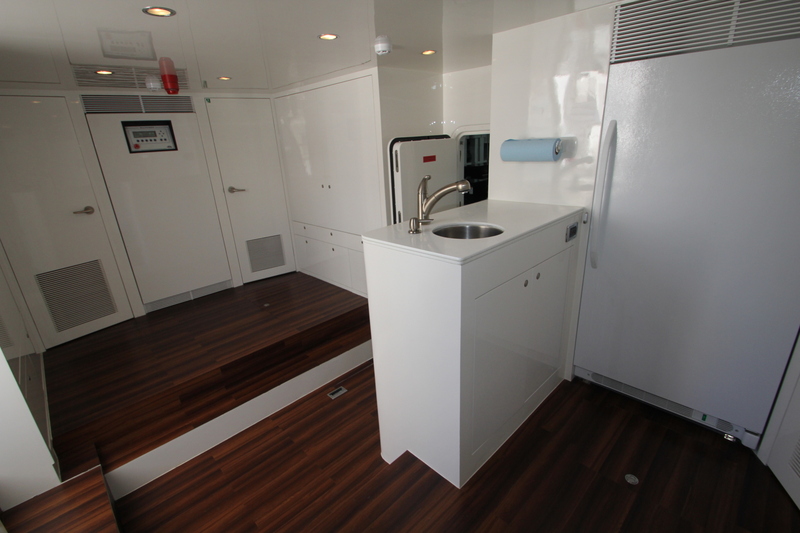 Bar equipped with Fridge/Icemaker Combo and Dishwasher. 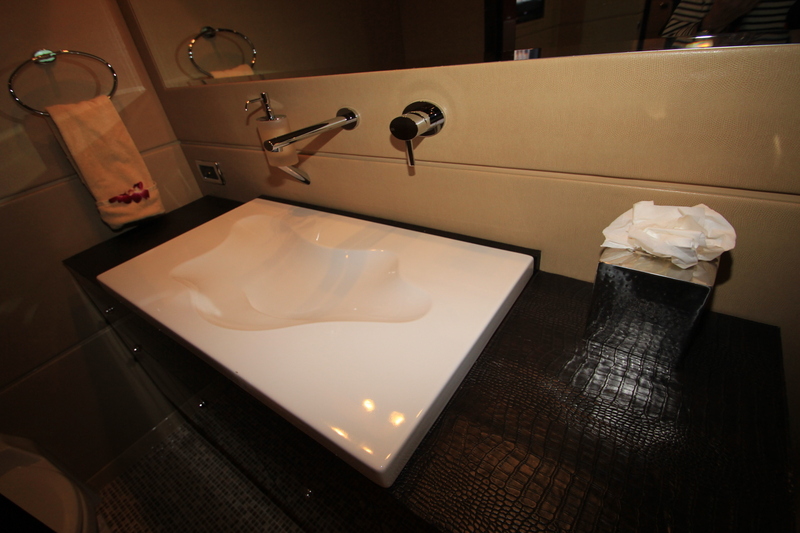 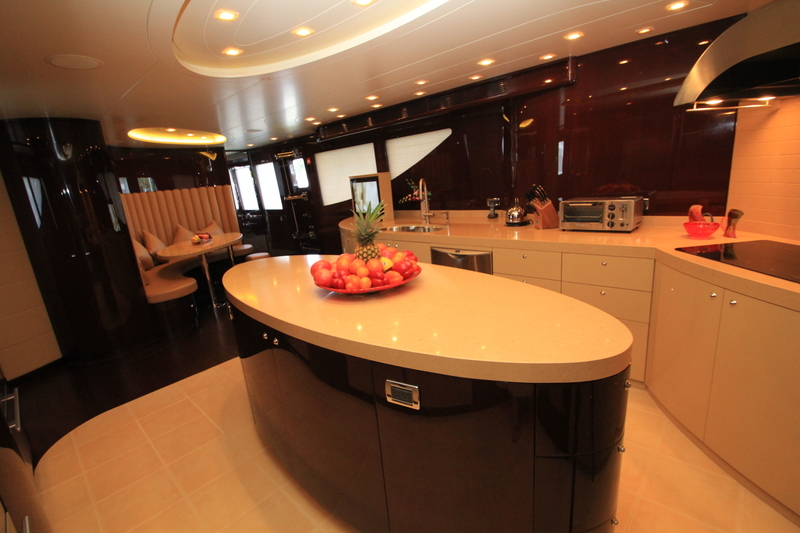 All counter tops on Fly Bridge are Corian. 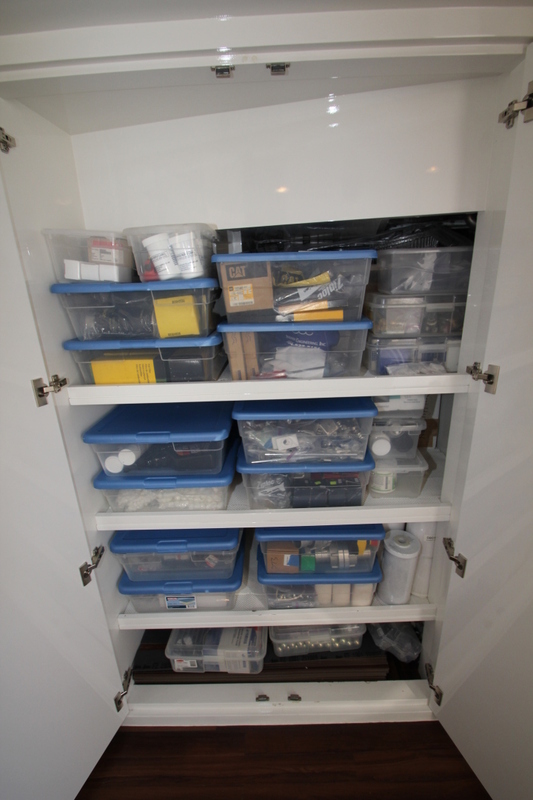 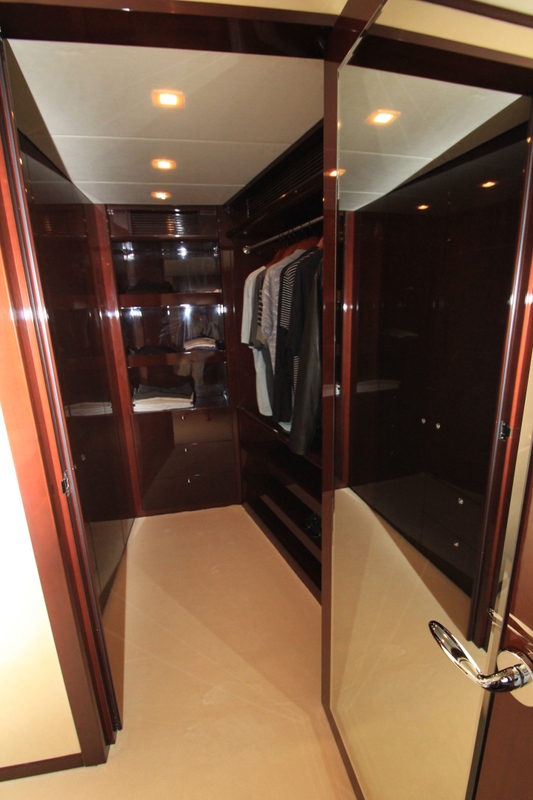 Walk­in closet with drawers and full hanging locker. 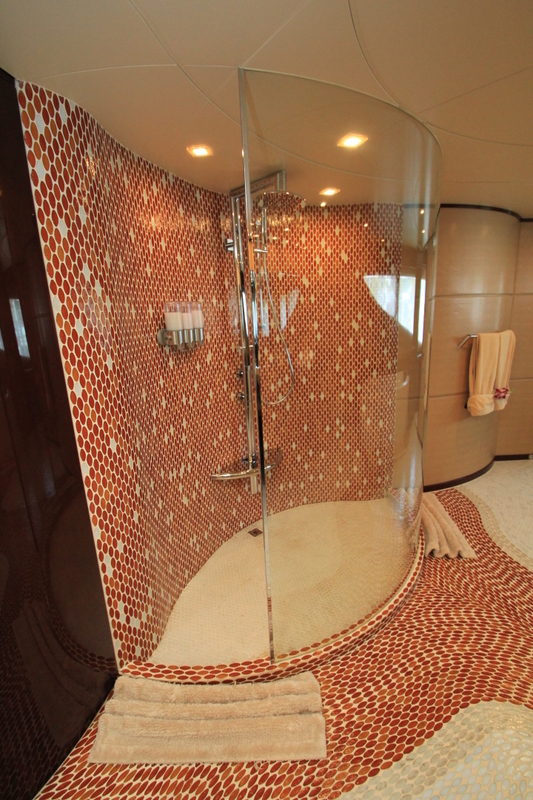 Freeform mosaic tile floor is crafted with Sicis waterglass tiles from the Italy’s Northern Region. 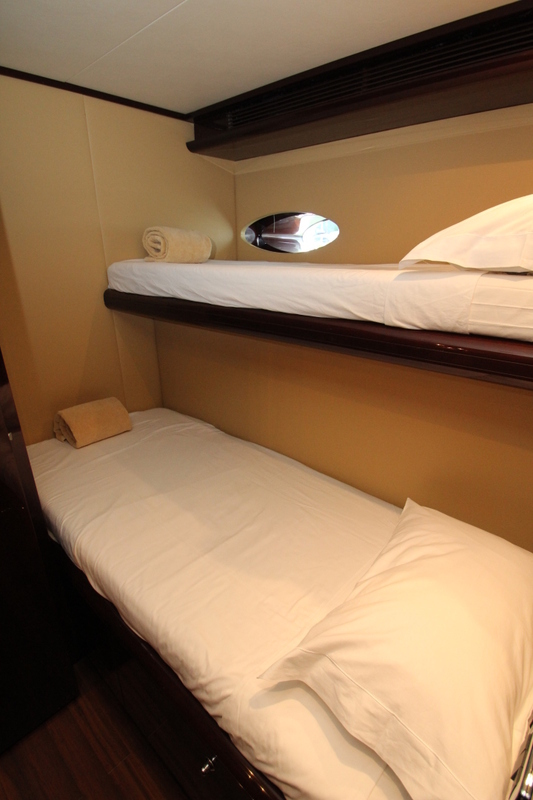 Foward Starboard VIP Stateroom is connected to a bunk room with two under berths with removable guardrails for the younger children to be near their parents. 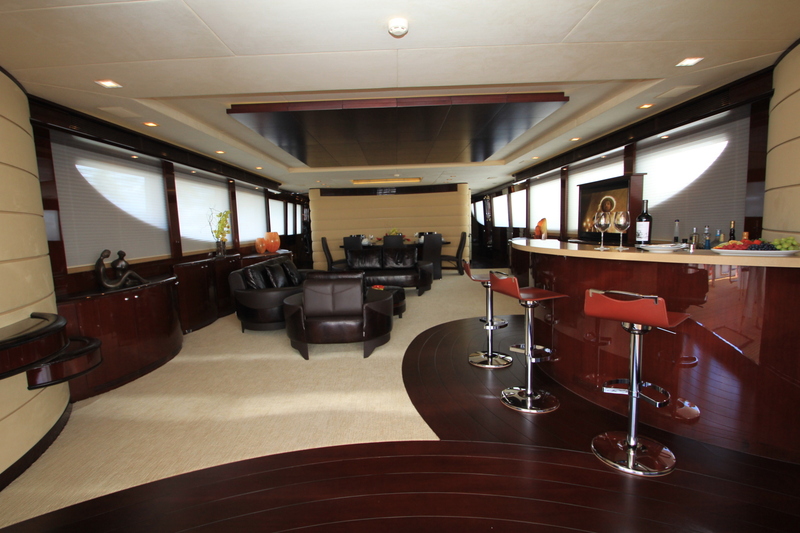 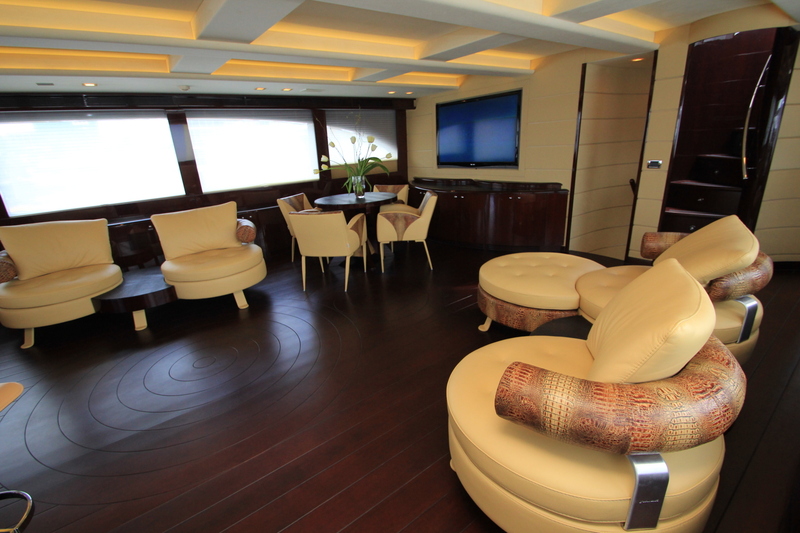 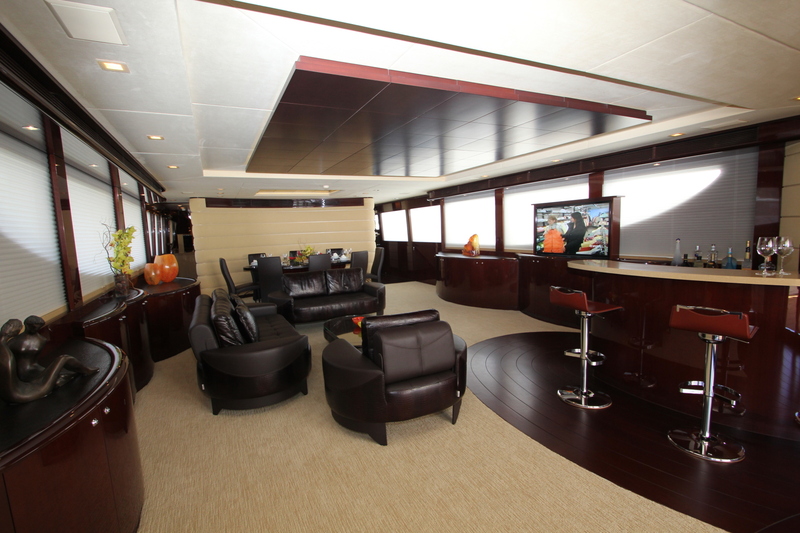 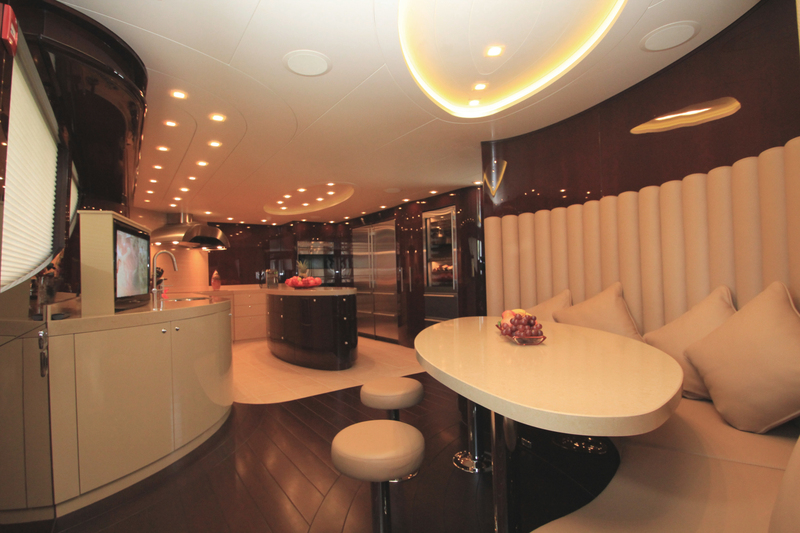 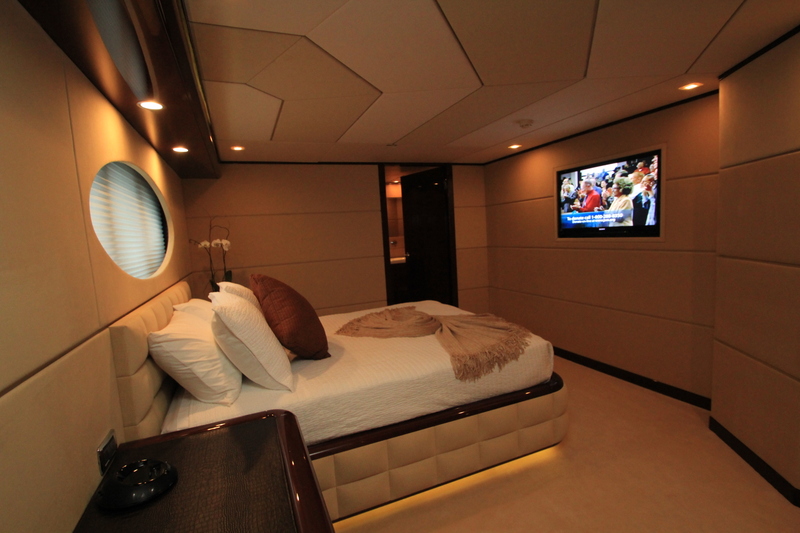 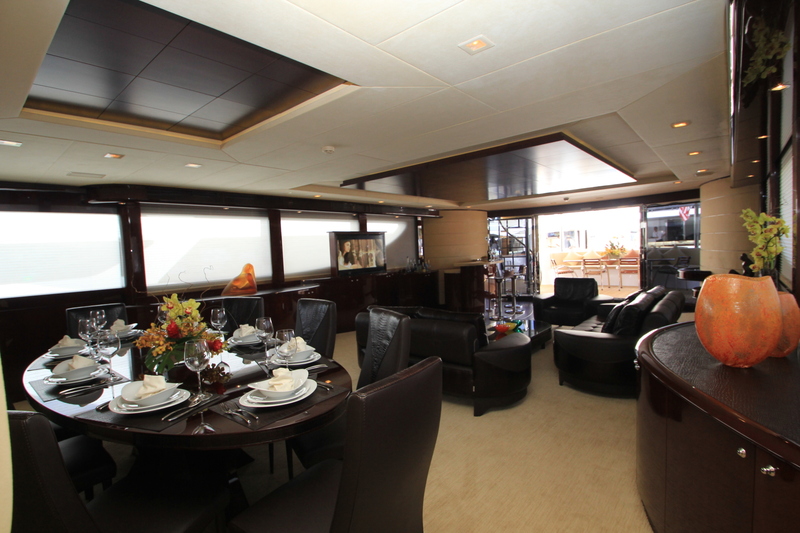 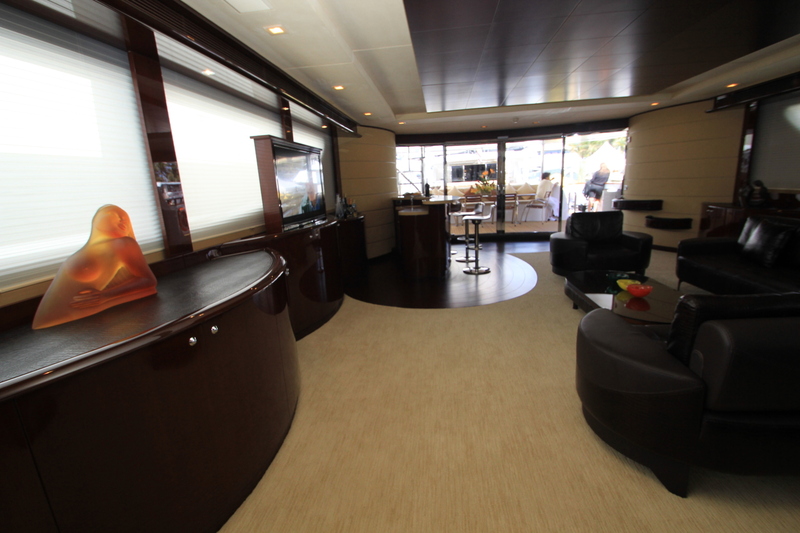 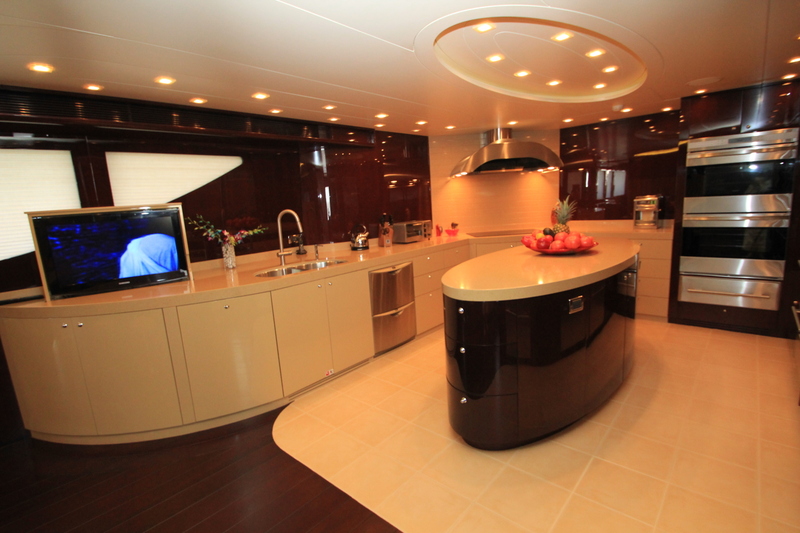 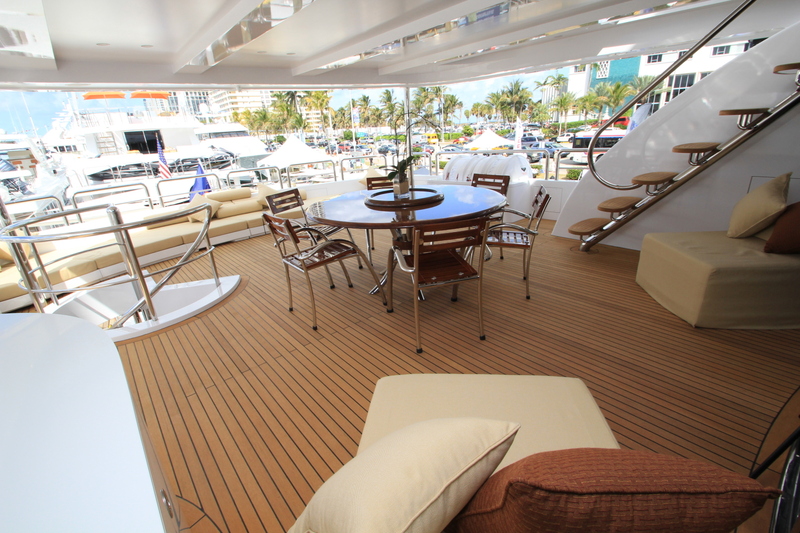 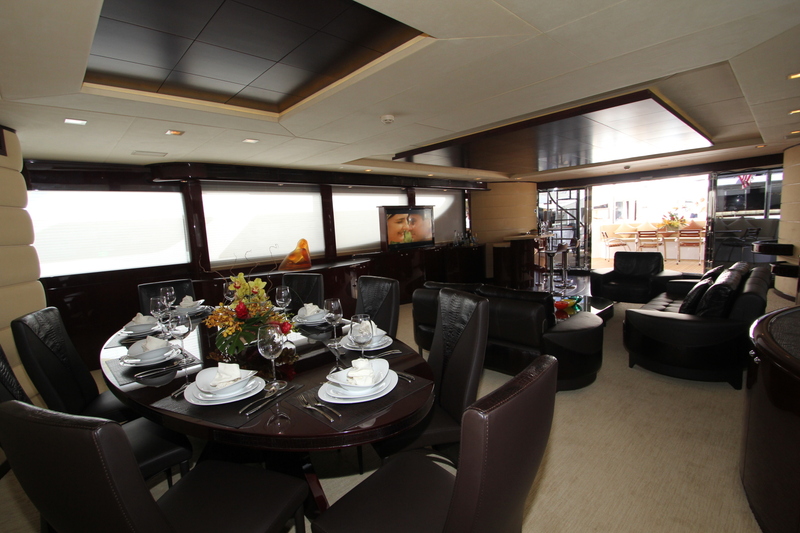 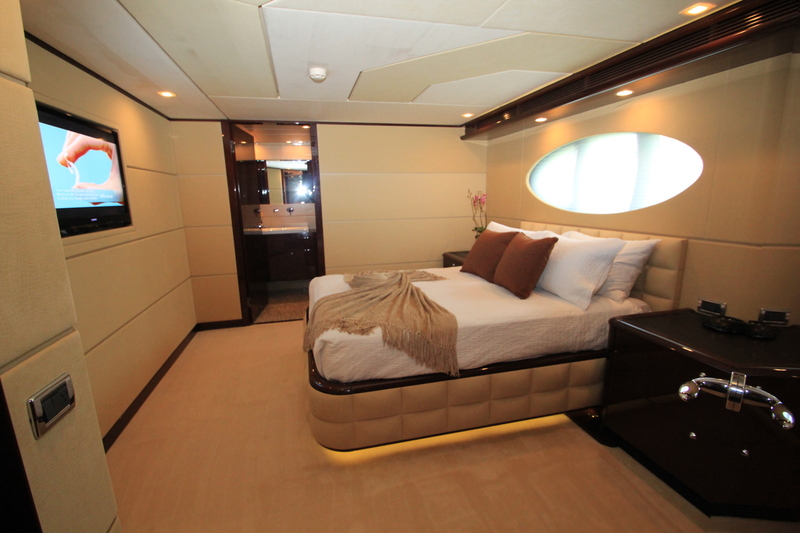 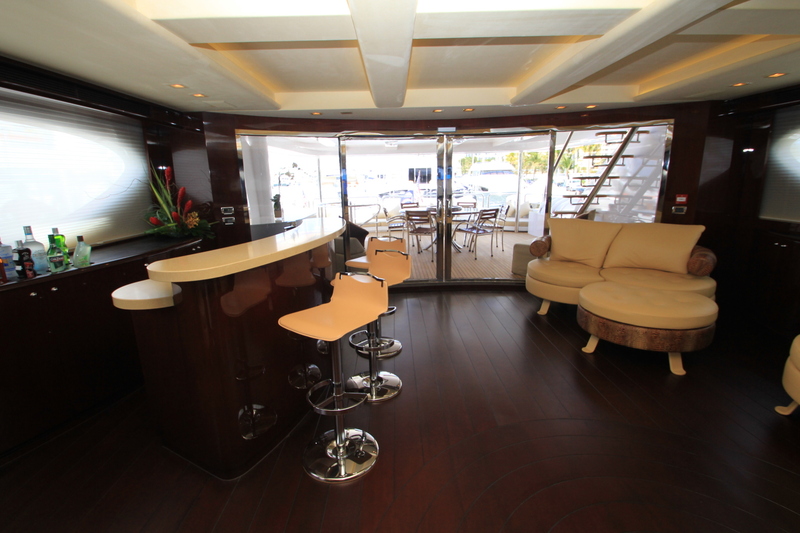 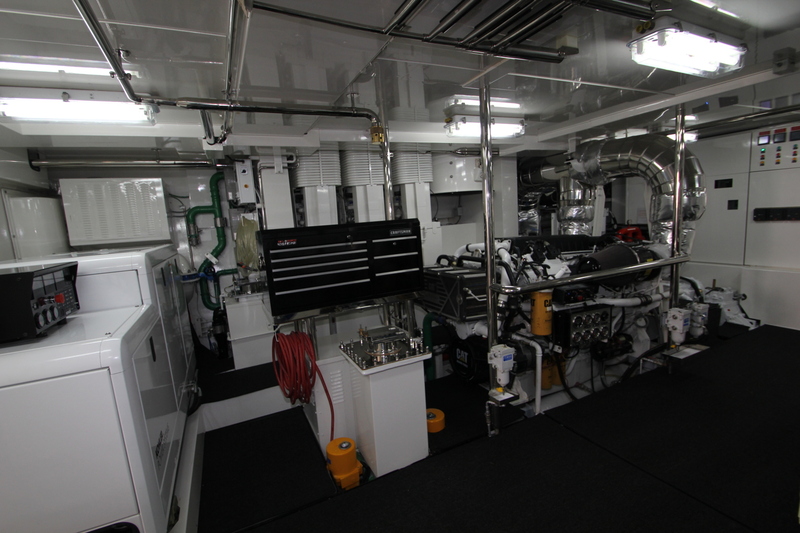 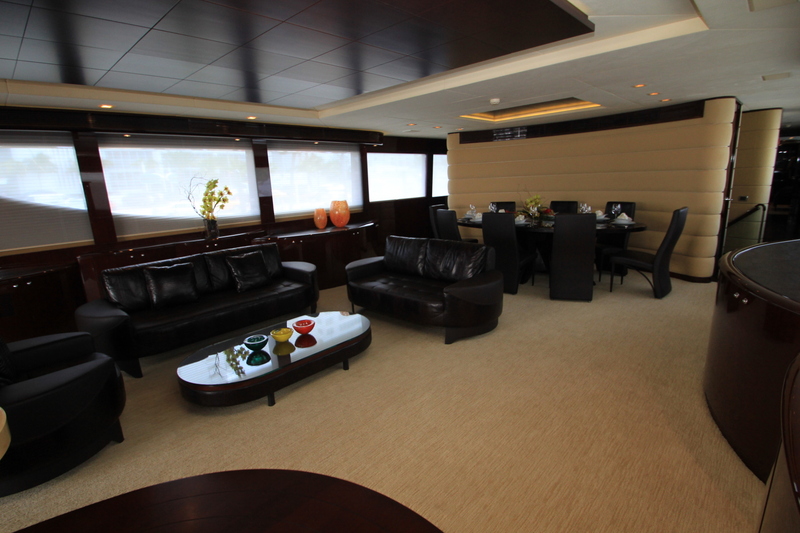 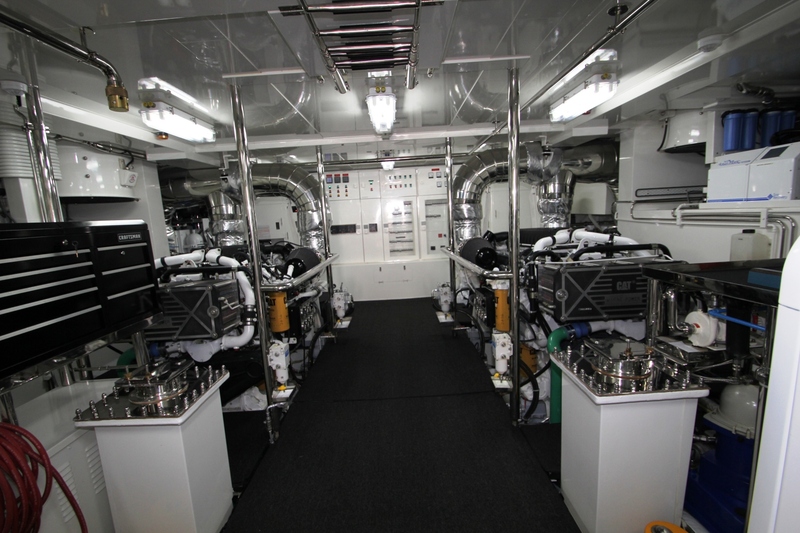 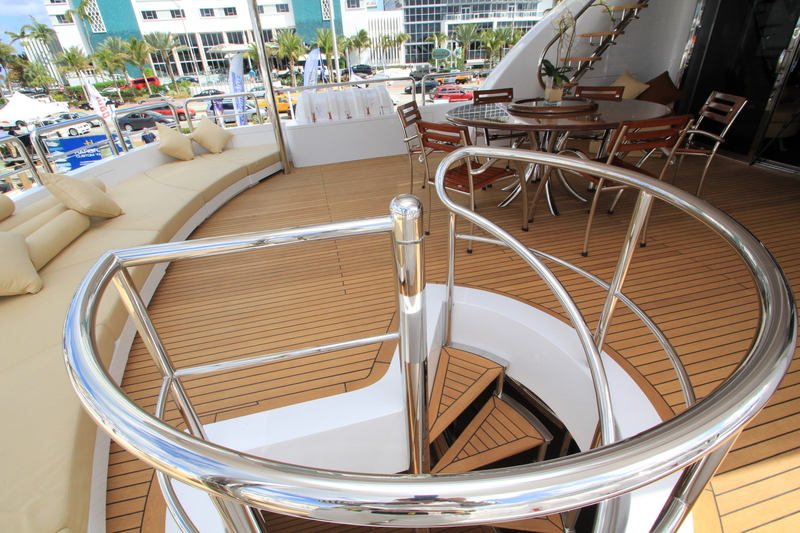 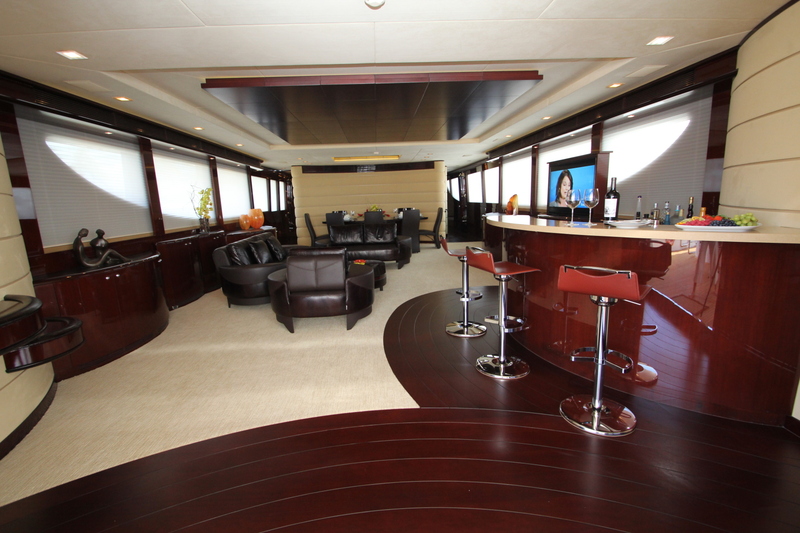 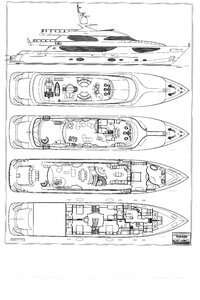 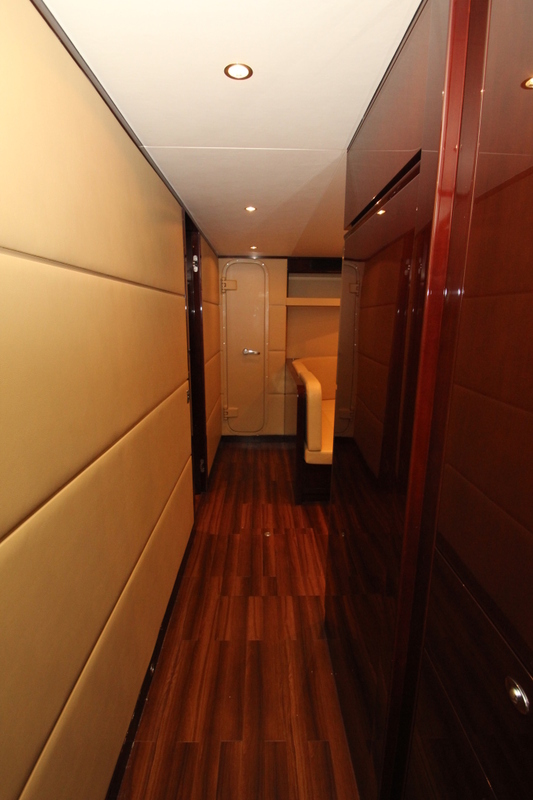 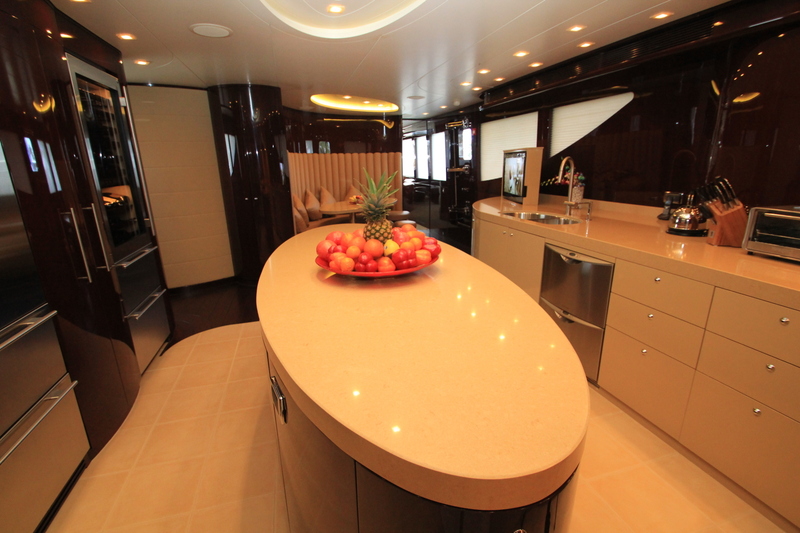 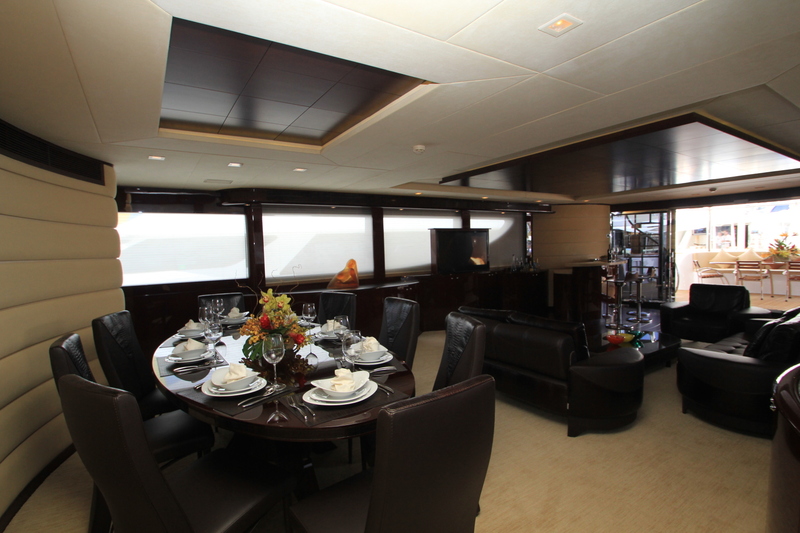 Located forward in the bow is the crew lounge with a fully equipped galley and dining area with seating for 8. 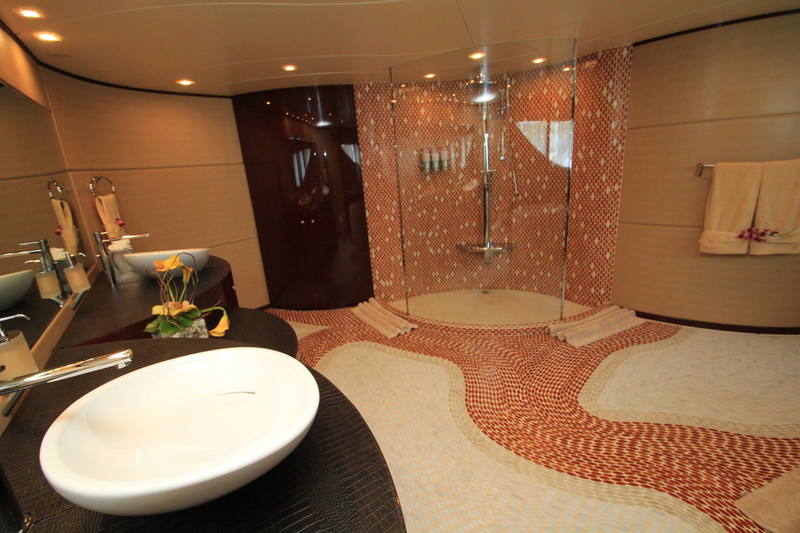 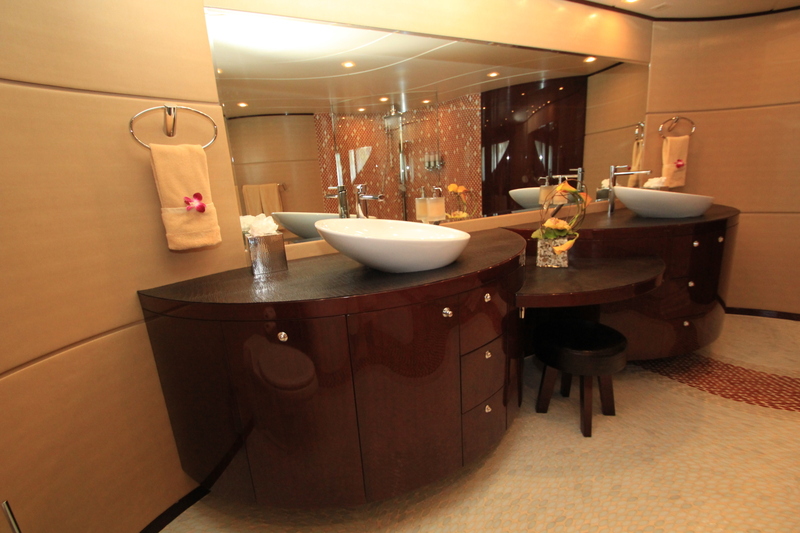 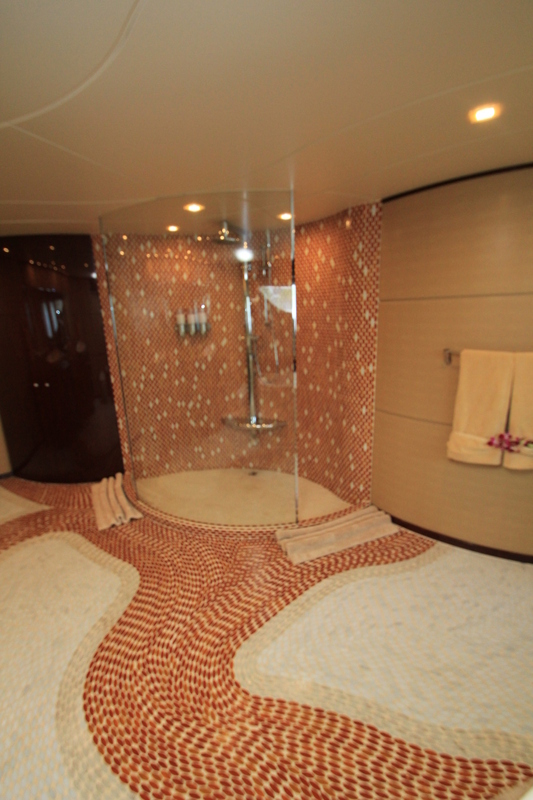 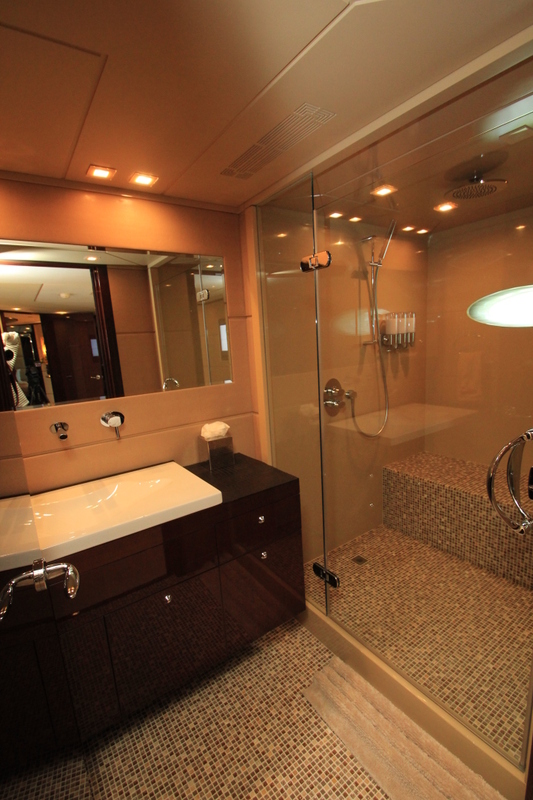 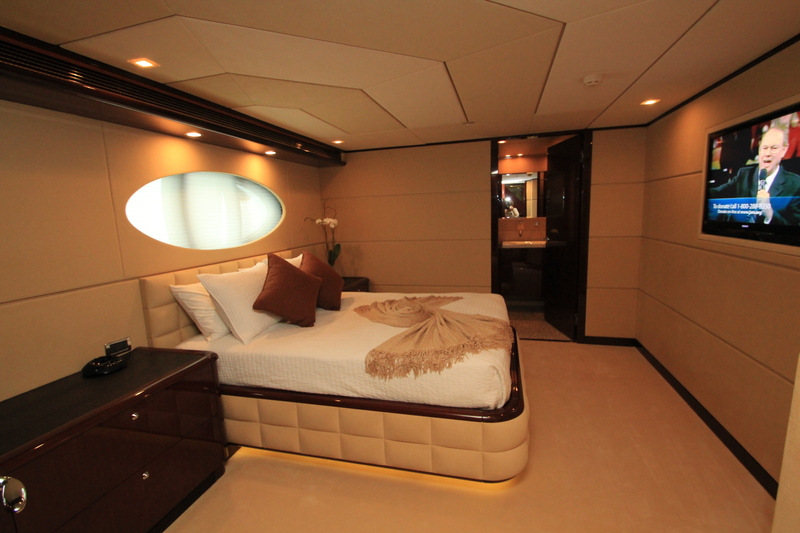 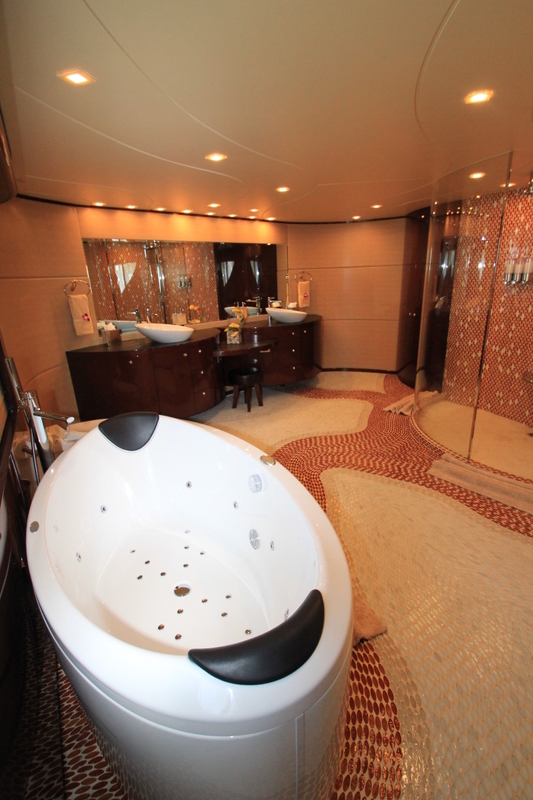 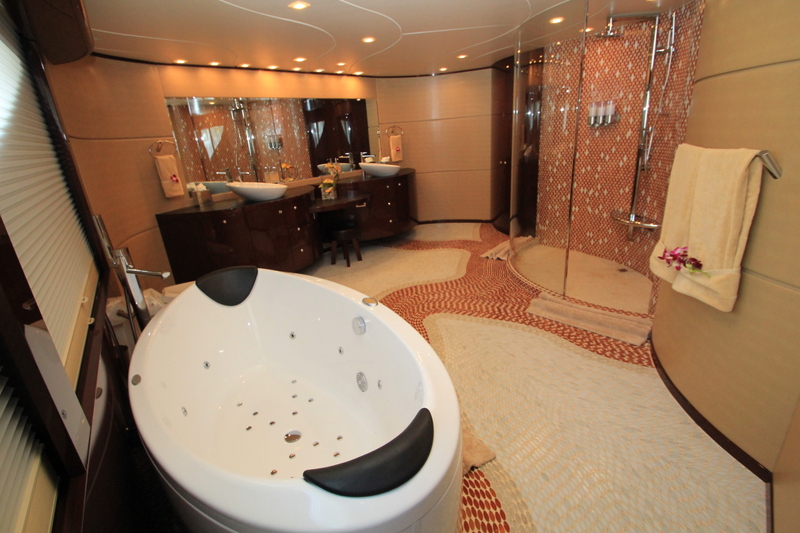 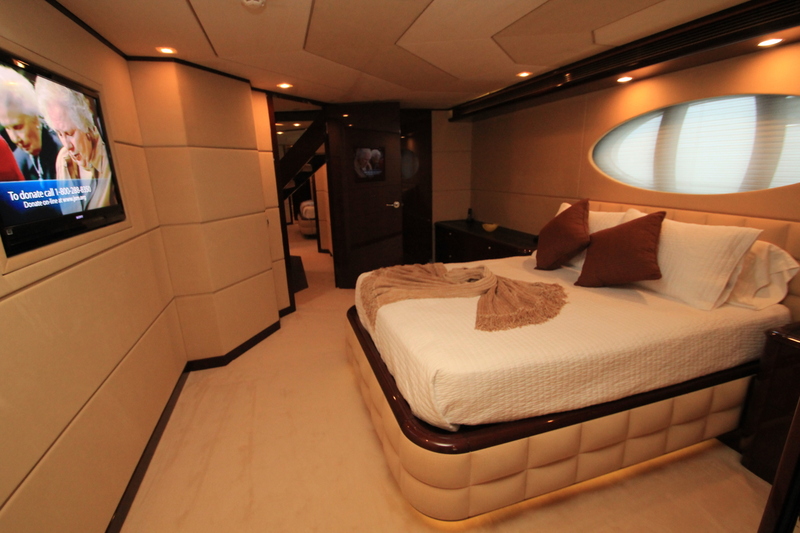 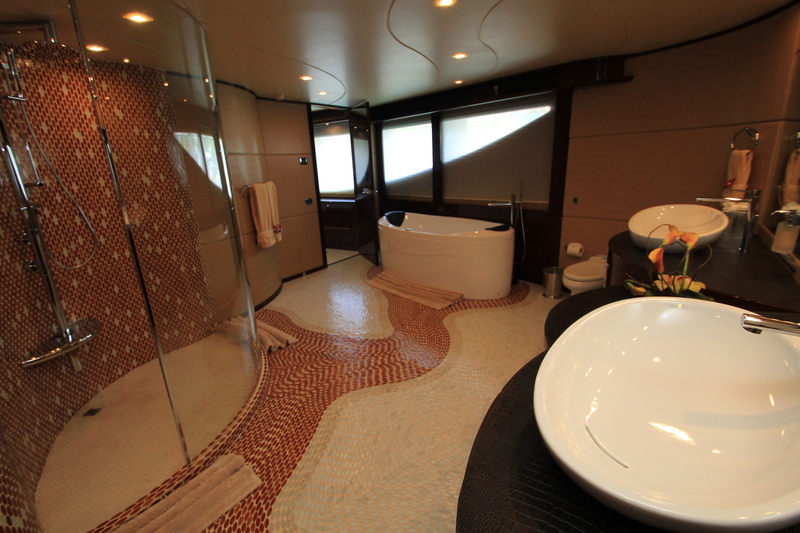 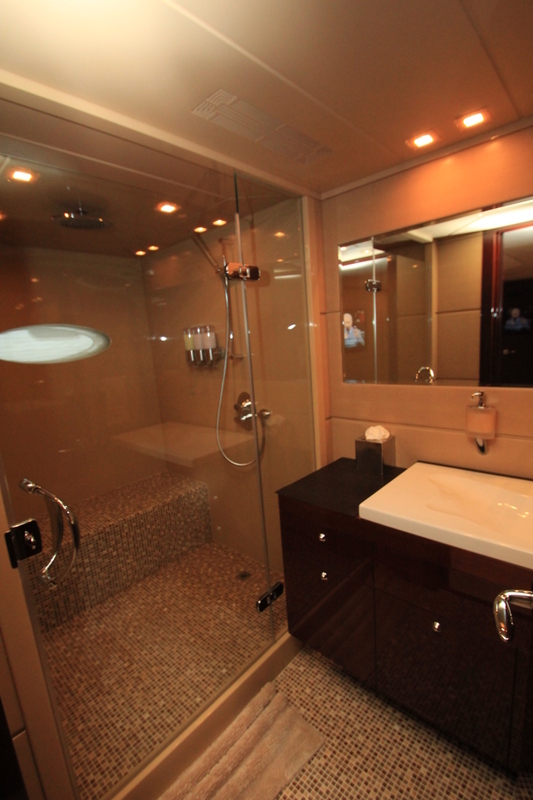 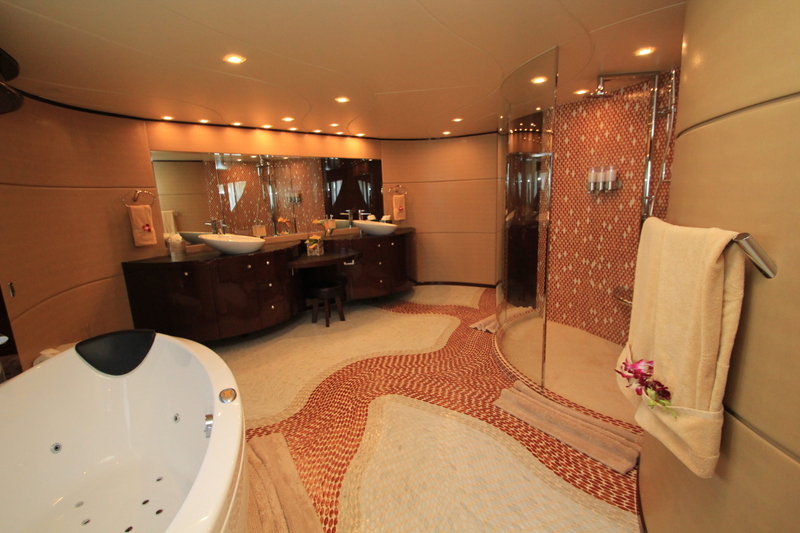 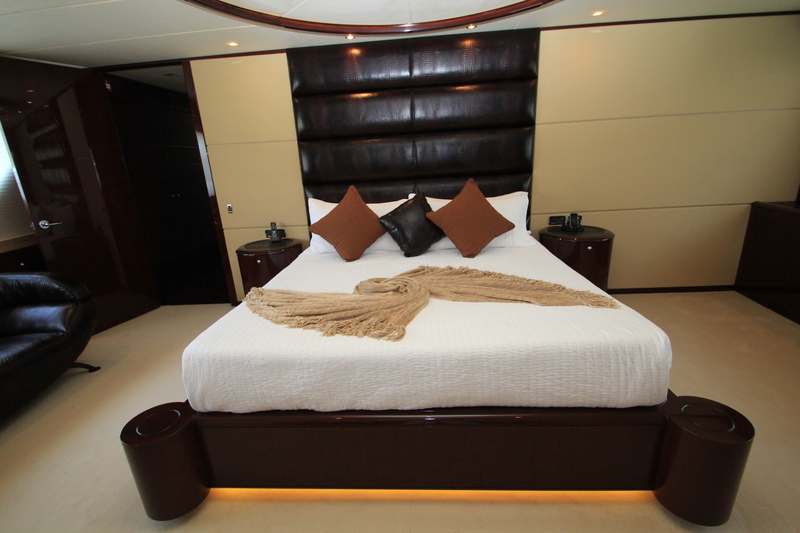 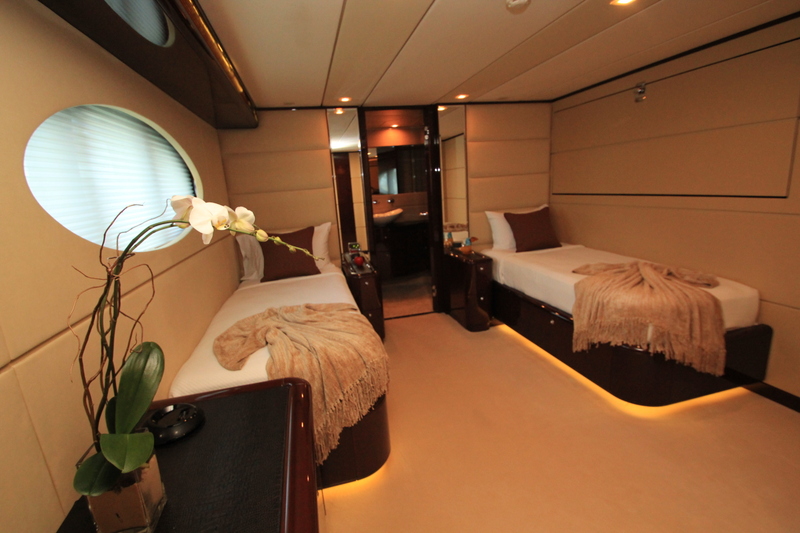 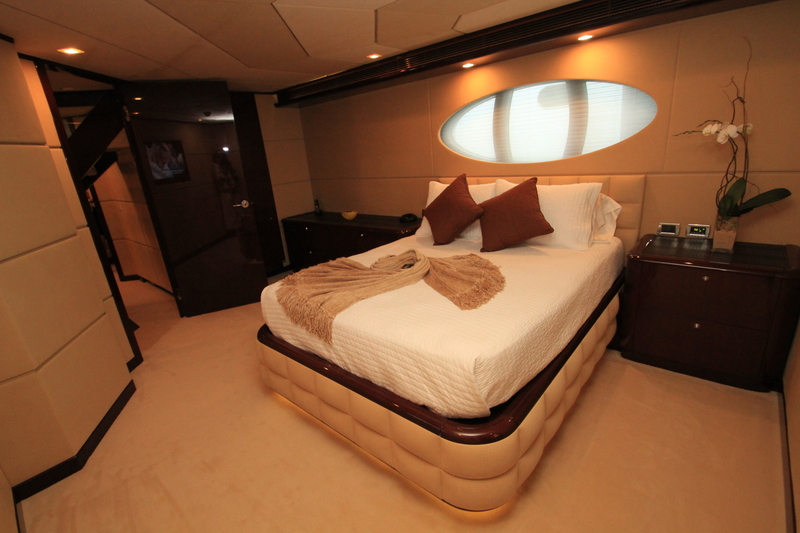 In addition to the Captain's cabin there are three additional cabins located forward on the cabin deck with ensuite heads finished with high quality finishes to equal the guest areas. 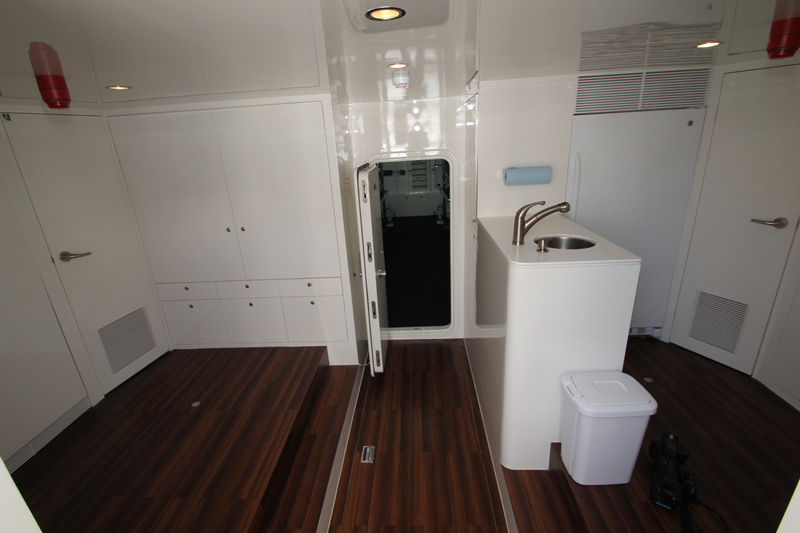 Painted with snow white algrip. 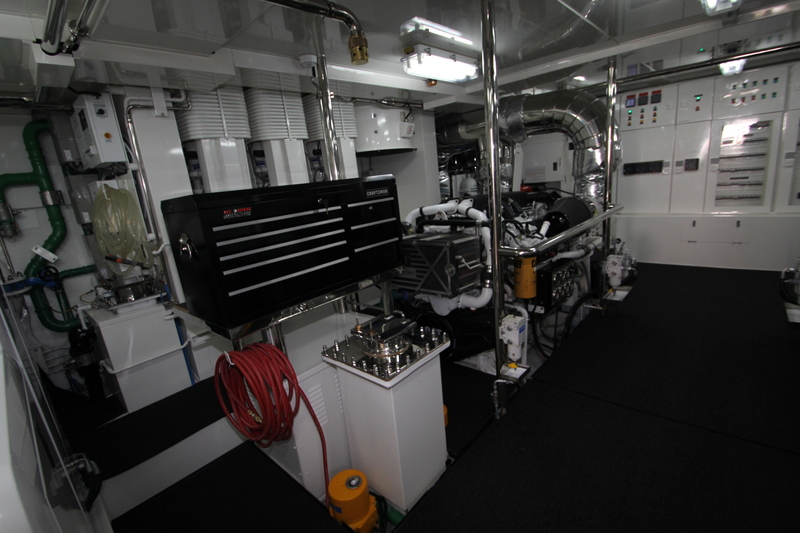 10,000 gallons of fuel all hard piped SS though out the boat. 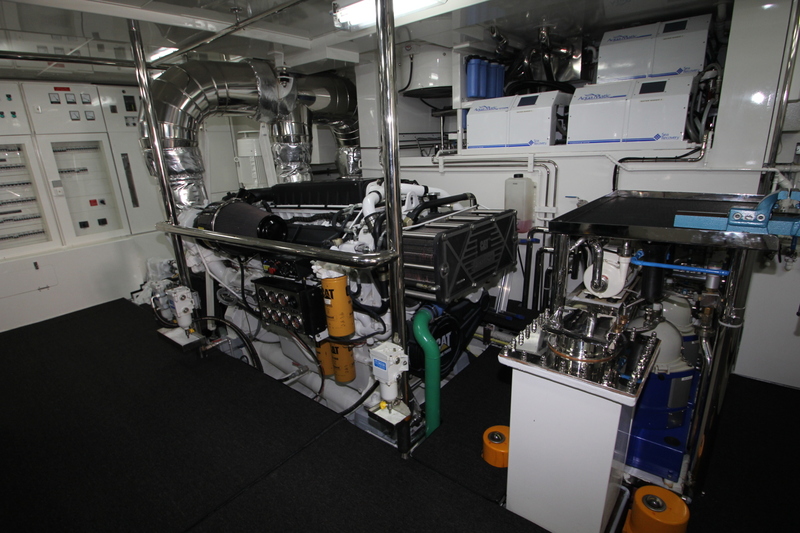 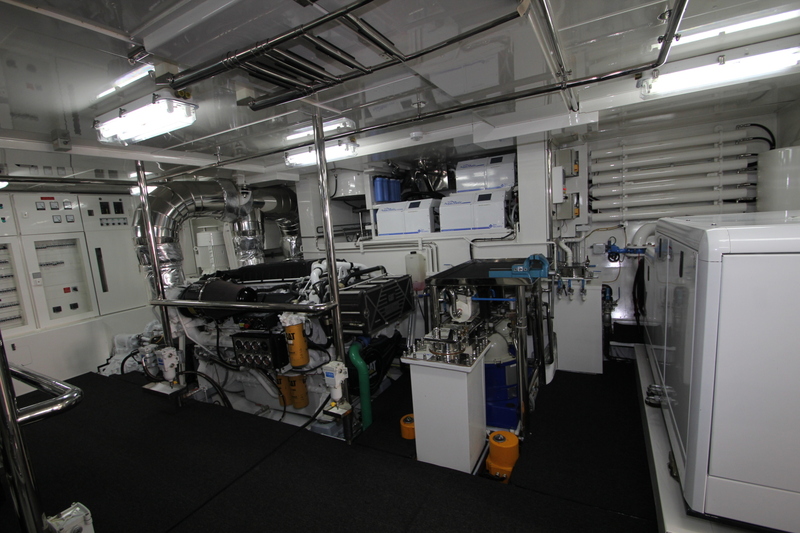 SCHNIEDER Electric Monitoring System with (4) Touch Screens throughout the boat: monitoring all tank levels, shorepower, cameras, high water level alarms for bilges and grey water lift stations, open door for Lazzarette and Engine Room,exhaust butterfly valve alarms Mains and Gens. 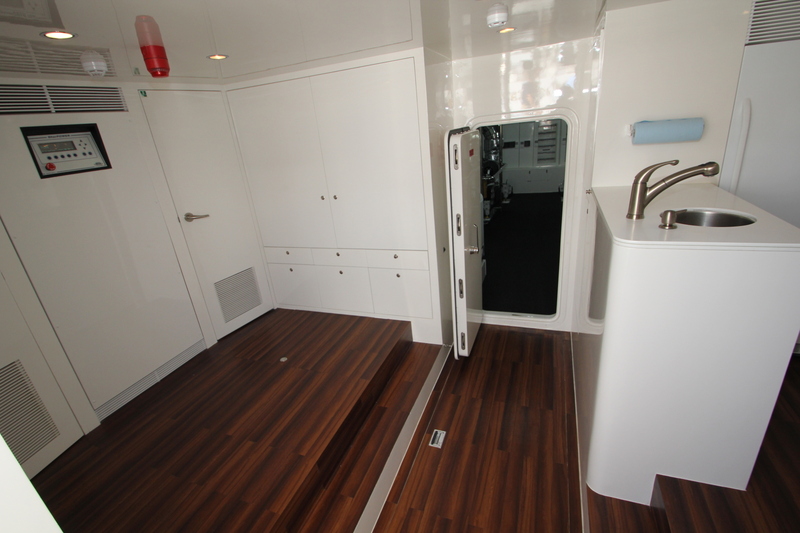 SPEAKER CRAFT / PARADIGM Speakers painted to match headliner. 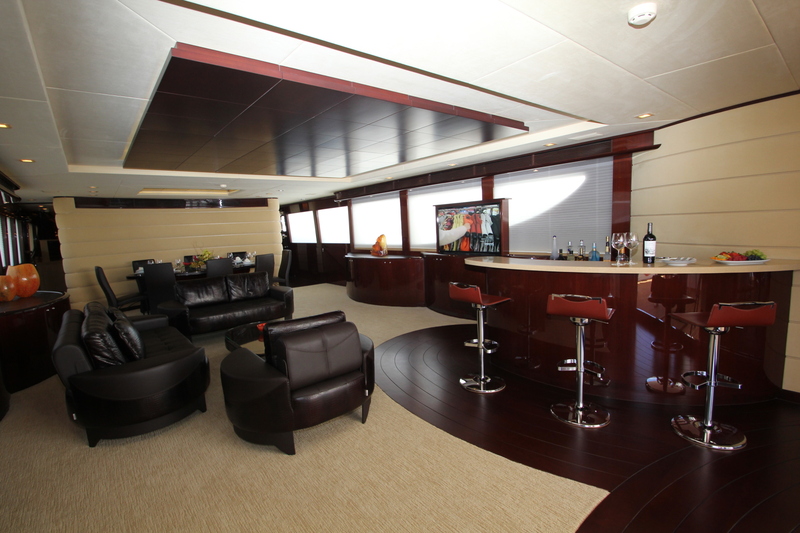 Rich Matorie Mahogany with amber stain is used for the fixed interior furniture and flooring is accented by leather, Ultrasuede and many other furnishings and finishes of the highest quality Ultra­suede padded head liner throughout wall upholstery though­out the boat is an embossed crocodile leather with ultra­suede mixed in. 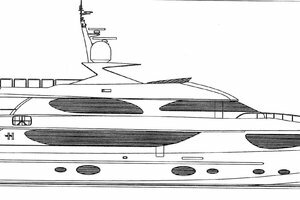 Please note that all personal items and artwork are excluded from the sale of this vessel, including various gift items. 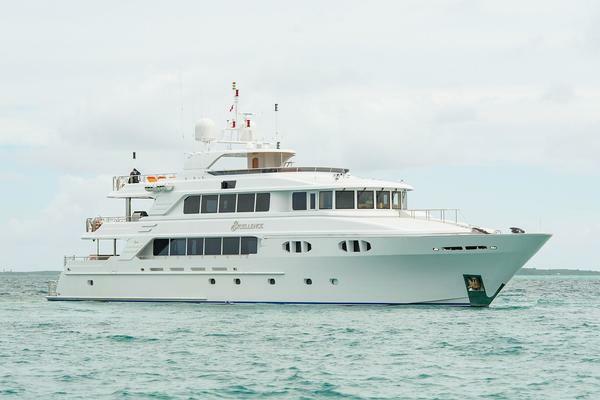 Interested parties can contact the listing broker for a complete itemized list.